12° Car. II. Parl. 1. A. 1660. Charles 13° & 14° Geo. II. Parl. 2. Sess. 1. A. 1661 & 1662. 15° Car. II. Parl. 2. Sess. 2. A. 1662 & 1663. 15° Car. II. Parl. 2. Sess. 2. A. 1662 & 1663. 16° Car. II. Parl. 2. Sess. 3. A. 1663 & 1664. 16° & 17° Car. II. Parl. 2. Sess. 4. A. 1664. 17° Car. II. Parl. 2. Sess. 5. A. 1665. 18° & 19° Car. II. Parl. 2. Sess. 6. A. 1666. 12° Car. II. Parl. 1. A. 1660. 13° & 14° Car. II. Parl. 2. Seff. 1. A. 1661 & 1662. 15° Car. II. Parl. 2. Seff. 2. A. 1662 & 1663. 16° Car. II. Parl. 2. Seff. 3. A. 1663 & 1664. 16° & 17° Car. II. Parl. 2. Sess. 4. A. 1664. 17° Car. II. Parl. 2. Sess. 5. A. 1665. 18° & 19° Car. II. Parl. 2. Sess. 6. A. 1666. 12° Car. II. Parl. 1. A. 1660. 13° & 14° Car. II. Parl. 2. Sess. 1. A. 1661, & 1662. 15° Car. II. Parl. 2. Sess. 2. A. 1662 & 1663. 16° Car. II. Parl. 2. Seff. 3. A. 1663, & 1664. 16° & 17° Car. II. Parl. 2. Sess. 4. A. 1664. 17° Car. II. Parl. 2. Seff. 5. A. 1665. 18° & 19° Car. II. Parl. 2. Sess. 6. A. 1666. 12° Car. II. Parl. 1. A. 1660. 13° & 14° Car. II. Parl. 2. Sess. 1. A. 1661 & 1662. 15° Car. II. Parl. 2. Sess. 2. A. 1662 & 1663. 16° Car. II. Parl. 2. Sess. 3. A. 1663 & 1664. 16° & 17° Car. II. Parl. 2. Sess. 4. A. 1664. 17° Car. II. Parl. 2. Sess. 5. A. 1665. 18° & 19° Car. II. Parl. 2. A. 1666. 12° Car. II. Parl. 1. A. 1660. 13° & 14° Car. II. Parl. 1. Sess. 1. A. 1661 & 1662. 15° Car. II. Parl. 2. Sess. 2. A. 1662 & 1663. 16° Car. II. Parl. 2. Sess. 3. A. 1663 & 1664. 16° & 17° Car. II. Parl. 2. Sess. 4. A. 1664. 17° Car. II. Parl. 2. Sess. 5. A. 1665. 18° & 19° Car. II. Parl. 2. Sess. 6. A. 1666. 12° Car. II. Parl. 1. A. 1660. 13° & 14° Car. II. Parl. 2. Sess. 1. A. 1661. & 1662. 15° Car. II. Parl. 2. Sess. 2. A. 1662 & 1663. 16° Car. II. Parl. 2. Sess 3. A. 1663 & 1664. 16° & 17° Car. II. Parl. 2. Sess. 4. A. 1664. 17° Car. II. Parl. 2. Sess. 5. A. 1665. 18° & 19° Car. II. Parl. 2. Sess. 6. A. 1666. 12° Car. II. Parl. 1. A. 1660. 13° & 14° Car. II. Parl. 2. Sess. 1. A. 1661 & 1662. 15° Car. II. Parl. 2. Sess. 2. A. 1662 & 1663. 16° Car. II. Parl. 2. Sess. 3. A. 1663 & 1664. 16° & 17° Car. II. Parl. 2. Sess. 4. A. 1664. 17° Car. II. Parl. 2. Sess. 5. A. 1665. 18° & 19° Car. II. Parl. 2. Sess. 6. A. 1666. 19° Car. II. Parl. 2. A. 1667. 12° Car. II. Parl. 1. A. 1660. 13° & 14° Car. II. Parl. 2. Sess. 1. A. 1661 & 1662. 15° Car. II. Parl. 2. Sess. 2. A. 1662 & 1663. 16° Car. II. Parl. 2. Sess. 3. A. 1663, & 1664. 16° & 17° Car. II. Parl. 2. Sess. 4. A. 1664. 17° Car. II. Parl. 2. Sess. 5. A. 1665. 18° & 19° Car. II. Parl. 2. Sess. 6. A. 1666. 12° Car. II. Parl. 1. A. 1660. ABINGDON, double Return, Report and Resolution concerning it, 27 Apr.-touching the Election, and Mayor ordered into Custody, 23 May. Discharged. Adams, Mr. Vide Haberdashers Company. Address, for a Thanksgiving Day upon the Restoration, resolved, 30 May. Vide Thanksgiving.-desiring the King to cause the Proclamation against Debauchery to be published, brought from the Lords, and agreed to, 13 June. Form of it, eod. die.-for putting off the Assizes, 19 July.-for calling an Assembly of Divines, and for a Proclamation to enforce the Laws against Profaneness. Answer reported, and Thanks returned thereon.-concerning an Order of Council to restrain the shipping of Cloth, and Answer thereto.- desiring the King to get the extraordinary Duties, laid by the Dutch upon the Woollen Manufactures, taken off, ordered to be drawn. Reported, and agreed to, and Lords desired to concur therein, 4 Sept.-for a Proclamation against exporting Wool, resolved, and agreed to by the Lords, 15 Aug.-for pardoning Sir H. Vane and Colonel Lambert, as to Life, ordered to be drawn, 28 Aug. Reported, and re-committed. New Draught reported. Passed, and sent to the Lords, and agreed to by them, 5 Sept.-desiring the King not to dispose of the forfeited Estates, till his Brothers were provided for, resolved, and Lords desired to concur therein, 1 Sept. Agreed to by them.-concerning Tenures. Vide Wards.-concerning the Crown Lands. Vide Crown. Lands.-touching Deane Forest, eod. die. Vide Deane Forest.-for a Proclamation about Payment of Excise, eod. die. Agreed to by the Lords, 10 Sept.-for a Proclamation against riding armed, eod. die. -for a Patent to the Clerk and Serjeant, 11 Sept. Answer.-for Commissioners to be appointed, to treat with Purchasers of Church Lands, and Lords desired to concur therein.-upon the King's Declaration concerning ecclesiastical Affairs, 6 Nov. House to attend him therewith.-upon the Petition about the quartering of Soldiers at Windsor. -, - to the Queen, upon her Return to England, 6 Nov. Her Answer reported. Admiral, Lord, to order the Oaths to be administered to the Fleet, 11 June. Albans, St. Election, Report and Resolution concerning it, 21 May. Aldred, John, excepted out of the Bill of Pardon, 9 June. Alienation Office, Order for Payment of Salaries to the Officers, 23 May. Allen, Francis, excepted out of the Bill of Pardon, 9 June. Allot, Colonel, his Petition to be considered, 19 July. Read, and referred to a Committee. Vide Swale. Amendments, sent from the Lords, Committee to consider of the Return to be made, upon agreeing thereto, 7 May. 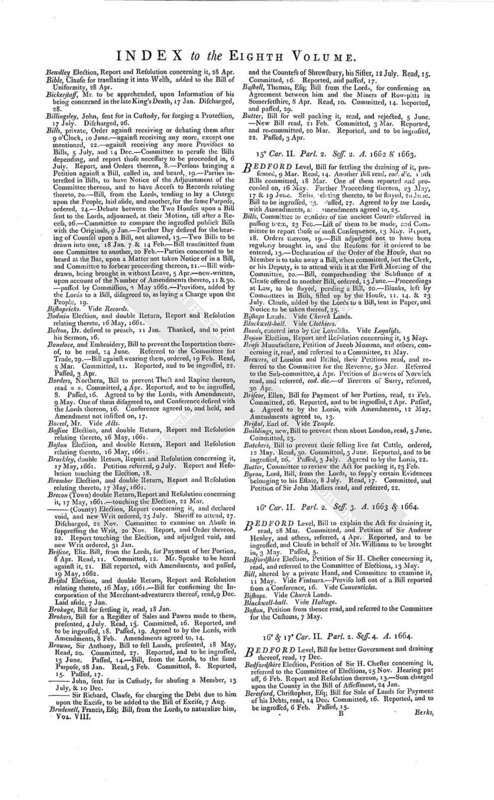 The usual Subscription written.-made to Bills from the Lords, how signed, 23 July.-sent from the Lords, ingrossed, and affixed to a Bill, and Exception taken thereto, 2 Aug. Taken off, and sent back severed from the Bill.-to be ingrossed into a Bill, when agreed to.-Reasons, inducing the House to agree to several, made by the Lords, to be communicated at a Conference, 15 & 24 Aug.-reduced into the Form of a Bill, by reason of their Length, and Variety, 11 Dec.
Andrews, Alderman, excepted out of the Bill of Pardon, 9 June. Ansell, Barbara, Proviso in her behalf, added to the Bill of Pardon, 7 July. Armour, Iron, Clause for exporting it, added to the Bill of Tonage and Poundage 21 July. Arms of the Commonwealth, over the Speaker's Chair, to be taken down, and the King's Arms to be set up, 8 May. Order for the like to be done in all other Places, and agreed to by the Lords. Army, Committee to confer with the Lord Mayor, & c. of London, about raising 50,000£. for it, 1 May. Address from the Officers to General Monck read. Grand Committee to consider of raising Money for the Army and Navy. Vide Supply. A Month's Pay for the Army to be made up out of the Three Months Assessment, and Order, for settling a Committee for it, to be prepared, 29 June. Bill for settling Commissioners and Treasurers for it, read, and laid aside, 12 July. New Bill presented and read. Committed. Reported, and to be ingrossed, 4 Aug.-Order for applying 40,000£. out of the Assessment, towards the Month's Pay for the Army, 1 Aug. Sent to the Lords. Agreed to by them. Committee appointed to examine the Debts of the Army and Navy. Conference desired with the Lords upon the King's Message concerning the bad State of them, and Committee to prepare Heads for it. Heads reported, eod. die. Another Conference, desired by the Lords upon the same Subject, held, and Committee of both Houses to go into the City, to borrow Money for the Army and Navy, 13 Aug. Committee for the Army appointed, and Money for its Use to be paid to their Order. Another Order for issuing 50,000£. out of the Assessment towards a Month's Pay for it, and for reserving the 40,000£. formerly ordered, towards disbanding it, eod. die. Agreed to by the Lords, 14 Aug. Report touching the monthly Pay of the Army, and the Arrears since 29 May, 1660, and Orders thereon. Further Report, and Resolutions, touching the Payment and disbanding of it, and Bill for disbanding it ordered. Bill, and Instructions, for that Purpose, presented, and read. Committed, 1 Sept. Bill reported, and to be ingrossed, and Amendments to the Instructions reported, and considered, and additional Instruction to be drawn. Reported, and agreed to, and Commissioners for disbanding the Army appointed, and Instructions to be ingrossed. Bill, and Instructions, passed, eod. die. Conference, desired by the Lords thereon, held, and reported, 7 Sept. Report considered, and Part of the Money, arising by the Poll-bill, to be applied towards paying off the Navy, and Two Months Assessment voted, to complete the disbanding of the Army, and for paying the Fleet, and free Conference, desired with the Lords thereon, agreed to, and held. Vide Supply. Bill returned from the Lords, with Amendments. Proceedings thereon, eod. die. Sent back with additional Amendments, and Amendments to the Lords Amendments, 11 Sept. Free Conference, desired by the Lords thereon, held, and reported, and Resolutions thereon, eod. die.-Order for issuing the 40,000£. reserved towards disbanding the Army, made, and agreed to by the Lords, 13 Sept. Lots for disbanding it prepared, and Lists of the Regiments read, and Order relating thereto, eod. die. Report touching the Progress made therein, 6 & 23 Nov.-touching the Debts of the Army and Navy, and Committee of the whole House to consider of raising Money for Payment thereof. Vide Supply. Orders for disbanding Colonel Oneale and Colonel Ingoldsby's Regiments. Further Report touching the Sums paid, and remaining due, to the Army and Navy, 3 Dec. Instructions for disbanding and paying them, to be prepared. Considered. To be ingrossed with the Bill for 18 Months Assessment. Arundell of Wardour, Lord, Bill from the Lords for restoring him to his Estate, 22 Nov. Read, 24 Nov. & 11 Dec. Passed, 17 Dec.
-, - Earl of. Vide Norfolk. Assessments. Vide Supply, and London.-Ordinance for bringing in the Arrears of the Six Months Assessment in 1659, to be prepared, 12 May. Presented, twice read, and committed. Passed, * *. Agreed to by the Lords, with Amendments, and Amendments agreed to. Form of it, eod. die.-Report touching the Arrears of the 12 and 6 Months Assessments in 1659, and Bill for collecting them ordered, 20 Aug. Presented, twice read, and committed, 6 Nov. Reported, and to be ingrossed. Passed. Agreed to by the Lords. Royal Assent, 29 Dec.
Assizes, King to be desired to put them off, and the Judges to be conferred with therein, 19 July. Message relating thereto delivered to the Lords. Astley, Francis, Bill from the Lords to naturalize him, 24 Nov.
Atkin, Alderman, displaced from the Excise, 15 Aug.
Attainder, of Oliver Cromwell, and others, Bill read twice, and committed, with Instructions, 7 Nov. Farther Instructions desired by the Committee, and Orders thereon. Evidence against the respective Persons reported, and re-committed, and several Petitions referred. Bill reported, and to be ingrossed, 4 Dec. Passed. Agreed to by the Lords, with Amendments, and Amendments agreed to. Aulnage Duties, to be considered by the Committee for Trade, 8 Nov.
Axtell, Daniel, excepted out of the Bill of Pardon, as to Pains and Penalties, 14 June. Clause added thereto by the Lords, for excepting him, and others, for Life, disagreed to, 13 Aug. Reasons offered by the Lords for adhering thereto, reported. Letter concerning him, and his Petition, read. Exception relating to him agreed to, and Lords to be acquainted with the Reason thereof, eod. die. Ayloffe, Wm. Vide Church Lands. Charles 13° & 14° Geo. II. Parl. 2. Sess. 1. A. 1661 & 1662. ABERGAVENNY, Lord, Bill, from the Lords, to sell Lands, 29 June. Read, 2 July. Committed, and Petition referred. Reported, 15 July. Passed. Accomptants, excepted in the Act of Oblivion, Bill, for obliging them to account, read, 8 Mar. Committed. Reported, and to be ingrossed. Passed, * *. Amendments made by the Lords thereto, considered, and some of them disagreed to, and Conference desired with the Lords thereon, 16 May, 1662. Conference agreed to, and held, and free Conference, desired by the Lords, agreed to. Acts, publick, Bill for confirming several, read, 13 May. Committed, with Instructions. Farther Instructions. Bill reported, and to be ingrossed. Read the Third time, and Proviso, touching the Act of Pardon, tendered, and debated, 14 June, Farther debated, and laid aside. Debate upon the Bill resumed. King's Letter, recommending the Dispatch of it, read, and Bill passed. Agreed to by the Lords, 6 July.-Bill, to confirm private Acts, read, 13 May, 1661. Committed, 11 July. Reported, and to be ingrossed. Passed. Agreed to by the Lords, with Amendments, and Amendments agreed to.-Bill, to confirm several publick Acts, left out of the former Bill, ordered, 28 May. Vide Ministers.-Bill, to confirm Four private Acts, read, 8 July.-Bill, to confirm Nine publick Acts, ordered, 25 July. Read twice, and to be ingrossed. Passed, eod. die.-Bill, to confirm Three Acts, read twice, and to be ingrossed, 27 July. Passed, eod. die.-Bill to confirm Two Acts, relating to the Marquis of Ormond and Sir Geo. 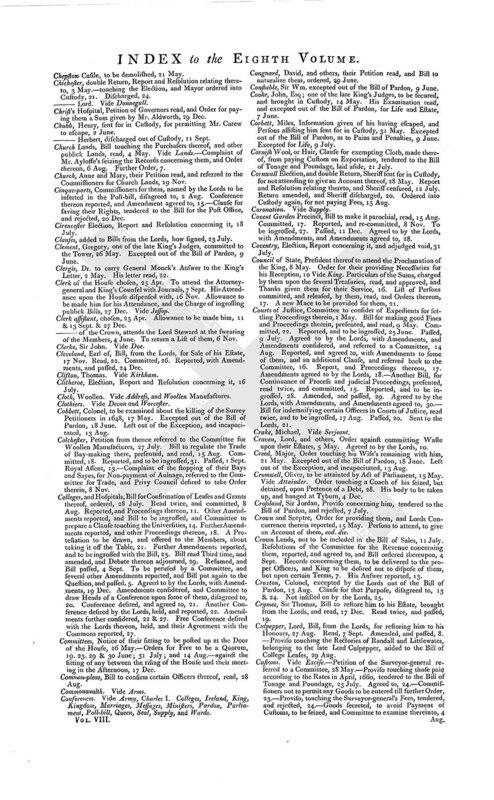 Lane, read, and Order for inserting Two other Acts, concerning Mr. Boreel and Sir Geo. Hamilton, 8 Jan. To be ingrossed. Passed, 7 Mar.-Bill to confirm Three Acts, read, 13 Jan. Committed. Reported, and to be ingrossed, 3 Feb. Passed.-Bill from the Lords, to confirm Two Acts, touching Lord Winchelsea and Lord Delamore, 8 Apr. 1662. Read. Passed, with Amendments. Conference desired by the Lords thereon, held, and reported, and Bill agreed to, without the Amendments, 10 May. -, -Committee to examine the Titles of several Acts, mentioned in a Bill, with the Records, 14 & 16 May, 1661. -to compare the printed Acts with the Originals, 9 Jan. -Lords desired to give Order against sending the original Rolls of Acts to the Printer.-Committee to consider of the Inconveniencies occasioned by the binding up of all the publick Acts together, and of Expedients for publishing them. -, -of the Commons, relating to the Commonwealth, to be burnt, 27 May, 1661; & 9 Apr. 1662. Address, upon the King's Speech, and intended Marriage, resolved, 11 May, 1661. Another, to the same Effect, delivered by the Lords at a Conference, and agreed to, and both Houses to attend the King therewith. His Answer reported, and Address to be printed.-for a Proclamation for a Fast, upon account of the great Rains, resolved, and agreed to by the Lords. Answer communicated, 6 June. -to restore Sir Ar. Haslerig's Estate, 11 July. Vide Haslerig. -recommending the Case of the Marquis of Winchester. Vide Winchester.-for a Proclamation to restrain the Number of Cattle drawing Carriages, and touching building upon old Foundations.-for disarming the cashiered Officers, and Soldiers, resolved, and agreed to by the Lords, and Committee of both Houses to attend the King therewith, 21 Nov.-concerning Informations of Designs against the publick Peace, 3 Dec.-desiring the King to distribute 60,000£. amongst the indigent loyal Officers. Vide Loyalists.- concerning the Colestreamers. Vide Colestreamers.-for detaining Wool stopped, and seizing Engines for packing it. Answer, 7 Jan.-for Instructions to Justices of Peace to prevent the engrossing of Corn. Answer.-desiring the King to remit the strict Observance of Lent, and forbid the transporting of Corn from Ireland to foreign Parts, 4 Feb. Answer.-for some Dignity in the Church to be conferred upon the Chaplain to the House. Answer. -concerning Money applicable to the Use of the Captives at Algiers and Tunis, 3 Apr. Answer reported, and farther Address resolved.-for a Proclamation for the free Exportation of Woollen Manufactures.-concerning Bedford and Lindsey Levels; touching Mr. Stoughton; against granting Patents of Mines; for a Proclamation to enforce the Observance of the Lord's Day, and against Swearing and Drunkenness; touching Presentations by Lapse; and a Debt due to Mrs. Gardiner; resolved, 19 May 1662. Advowsons, Rectories, & c. Bill to restore them to the King's loyal Subjects, read, 4 July. Committed. Reported, and to be ingrossed. Passed. Agreed to by the Lords, with Amendments, and a Proviso, 9 May, 1662. Amendments, considered, and Proviso disagreed to. A Saving as to the Heirs of Sir Richard Luson, and others in like Case, to be drawn instead of it. Reported, and to be added, and Conference held with the Lords thereon, and Saving agreed to. Albans, St. Election, Report and Resolution concerning it, 25 Jan.
Albemarle, Duke of, Bill, to confirm Letters Patents to him, read, 17 Mar. Committed. Reported, and to be ingrossed. Passed. Agreed to by the Lords, with Amendments, 3 Apr. Amendments agreed to. Algiers Duty, Bill to revive it, ordered, 10 May, 1662. Allegiance, Bill for instructing People therein, to be read, 26 Feb.
Alsop, Dr. desired to preach, 11 Jan. Thanked, and to print his Sermon. 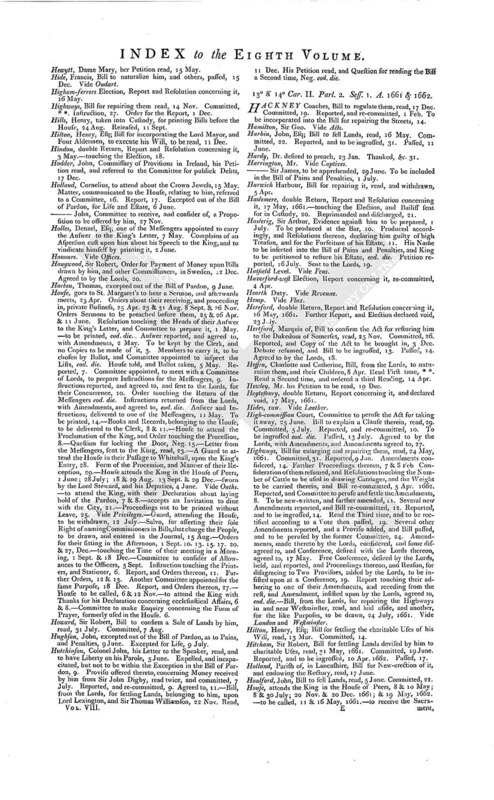 Amendments, to a Bill, lost from the Table, and Order thereon, 25 June. Conference desired with the Lords, touching an Amendment sent in Paper, which should have come ingrossed, 13 Dec. Agreed to, and held. Amendment sent back ingrossed.-Amendments to be perused and settled by a Committee, 8, 24 & 28 Apr.-Declaration of the Reasons, inducing the House to agree to Amendments made by the Lords, to be entered in the Journal, 17 May. Army and Navy, Report from the Commissioners for disbanding and paying them, and Orders thereon, 11 July. Farther Report, and Order thereon. Committee to take the Accounts of the Commissioners, 23 Nov. Impowered to call the Treasurers to account. Arrests, vexatious, and Delays in Law-suits, Bill, from the Lords, to prevent them, 11 Dec. Read. Passed. Arundell, Earl of. Vide Norfolk. Ashburnham, Colonel, excused from receiving the Sacrament, upon Account of Sickness, 28 May, 1661. Ashton, Sir Ralph, desires to shew his Reasons, why he cannot receive the Communion, 22 May. Assessments, and Poll-money, Letters to be sent for bringing in the Arrears and Accounts thereof, 11 July.-Bill for 18 Months Assessment, ordered, 27 Nov. Vide Supply. Assurance, Court of, Bill for Additions to the Act concerning it, read, 10 Jan. Committed. Reported, and to be ingrossed. Passed, 1 Feb. Agreed to by the Lords, with Amendments. Amendments agreed to. Attorney-general, to prepare Evidence against Sir Ar. Haslerig, 1 & 4 July. To speed the Prosecution against Sir H. Vane and Colonel Lambert. Aulnage Duty, Bill to ascertain it, read, 28 Nov. Committed, 6 Dec. Petition from Warwick and Coventry referred, 22 Jan. Bill to be reported, 28 Feb.
15° Car. II. Parl. 2. Sess. 2. A. 1662 & 1663. ACTS, Committees appointed to inspect several, 19, & 23 Feb. 12 Mar. 13 & 29 Apr. Report touching the Act of Uniformity, 9 Mar.-the Militia Act, 3, Apr.-the Acts against Sale of Offices, 2 May.-the Act for Relief of the Poor.-the Act concerning Alimony, 10 July. Vide Singula. Bewdley Election, Report and Resolution concerning it, 28 Apr. Bible, Clause for translating it into Welsh, added to the Bill of Uniformity, 28 Apr. Bickerstaff, Mr. to be apprehended, upon Information of his being concerned in the late King's Death, 17 Jan. Discharged. Billingsley, John, sent for in Custody, for forging a Protection, 17 July. Discharged. 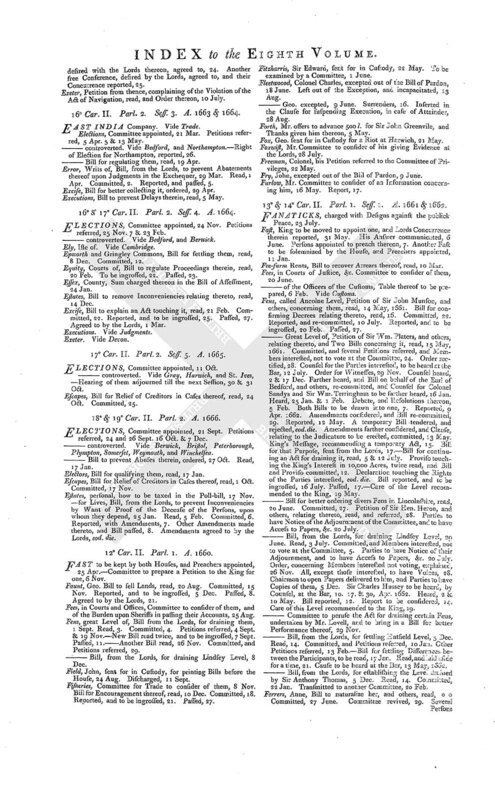 Bills, private, Order against receiving or debating them after 9 o'Clock, 10 June.-against receiving any more, except one mentioned.-against receiving any more Provisoes to Bills, 5 July, and 14 Dec.-Committee to peruse the Bills depending, and report those necessary to be proceeded in, 6 July. Report, and Orders thereon.-Persons bringing a Petition against a Bill, called in, and heard.-Parties interested in Bills, to have Notice of the Adjournment of the Committee thereon, and to have Access to Records relating thereto.-Bill, from the Lords, tending to lay a Charge upon the People, laid aside, and another, for the same Purpose, ordered.-Debate between the Two Houses upon a Bill sent to the Lords, adjourned, at their Motion, till after a Recess.-Committee to compare the ingrossed publick Bills with the Originals, 9 Jan.-Further Day desired for the hearing of Counsel upon a Bill, not allowed.-Two Bills to be drawn into one, 18 Jan. 7 & 14 Feb.-Bill transmitted from one Committee to another, 20 Feb.-Parties concerned to be heard at the Bar, upon a Matter not taken Notice of in a Bill, and Committee to forbear proceeding thereon.-Bill withdrawn, being brought in without Leave, 5 Apr.-new-written, upon account of the Number of Amendments thereto. -passed by Commission, 2 May 1662.-Provisoes, added by the Lords to a Bill, disagreed to, as laying a Charge upon the People. Bodmin Election, and double Return, Report and Resolution relating thereto, 16 May, 1661. Bolton, Dr. desired to preach, 11 Jan. Thanked, and to print his Sermon. Bonelace, and Embroidery, Bill to prevent the Importation thereof, to be read, 14 June. Referred to the Committee for Trade.-Bill against wearing them, ordered, 19 Feb. Read, 5 Mar. Committed. Reported, and to be ingrossed. Passed, 3 Apr. Borders, Northern, Bill to prevent Theft and Rapine thereon, read * *. Committed, 4 Apr. Reported, and to be ingrossed. Passed. Agreed to by the Lords, with Amendments, 9 May. One of them disagreed to, and Conference desired with the Lords thereon. Conference agreed to, and held, and Amendment not insisted on. Bossine Election, and double Return, Report and Resolution relating thereto, 16 May, 1661. Boston Election, and double Return, Report and Resolution relating thereto, 16 May, 1661. Brackley, double Return, Report and Resolution concerning it, 17 May, 1661. Petition referred, 9 July. Report and Resolution touching the Election. Bramber Election, and double Return, Report and Resolution relating thereto, 17 May, 1661. Brecon (Town) double Return, Report and Resolution concerning it, 17 May, 1661.-touching the Election, 22 Mar. -, - (County) Election, Report concerning it, and declared void, and new Writ ordered, 25 July. Sheriff to attend. Discharged, 22 Nov. Committee to examine an Abuse in suppressing the Writ, 20 Nov. Report, and Order thereon. Report touching the Election, and adjudged void, and new Writ ordered, 31 Jan.
Briscoe, Eliz. Bill, from the Lords, for Payment of her Portion, 8 Apr. Read. Committed. Mr. Speake to be heard against it. Bill reported, with Amendments, and passed, 19 May, 1662. Bristol Election, and double Return, Report and Resolution relating thereto, 16 May, 1661.-Bill for confirming the Incorporation of the Merchant-adventurers thereof, read, 9 Dec. Laid aside, 7 Jan.
Brokage, Bill for settling it, read, 18 Jan. Brokers, Bill for a Register of Sales and Pawns made to them, presented, 4 July. Read. Committed. Reported, and to be ingrossed. Passed. Agreed to by the Lords, with Amendments, 8 Feb. Amendments agreed to. Browne, Sir Anthony, Bill to sell Lands, presented, 18 May, Read. Committed. Reported, and to be ingrossed, 13 June. Passed.-Bill, from the Lords, to the same Purpose, 28 Jan. Read, 3 Feb. Committed. Reported. Passed. -, -John, sent for in Custody, for abusing a Member, 13 July, & 10 Dec.
-, -Sir Richard, Clause, for charging the Debt due to him upon the Excise, to be added to the Bill of Excise, 7 Aug.
Brudenell, Francis, Esq; Bill, from the Lords, to naturalize him, and the Countess of Shrewsbury, his Sister, 12 July. Read. Committed. Reported, and passed. Bushell, Thomas, Esq; Bill from the Lords, for confirming an Agreement between him and the Miners of Row-pitts in Somersetshire, 8 Apr. Read. Committed. Reported, and passed. Butter, Bill for well packing it, read, and rejected, 5 June. -New Bill read, 21 Feb. Committed, 3 Mar. Reported, and re-committed, 20 Mar. Reported, and to be ingrossed. Passed, 3 Apr. BEDFORD Level, Bill for settling the draining of it, presented, 9 Mar. Read. Another Bill read, eod. die. Both Bills committed, 18 Mar. One of them reported and proceeded on, 16 May. Farther Proceeding thereon, 23 May, 17 & 19 June. Suits, relating thereto, to be stayed, 20 June. Bill to be ingrossed. Passed. Agreed to by the Lords, with Amendments, and Amendments agreed to. Bills, Committee to consider of the ancient Course observed in passing them, 23 Feb.-List of them to be made, and Committee to report those of most Consequence, 13 May. Report. Orders thereon.-Bill adjudged not to have been regularly brought in, and the Reasons for it ordered to be entered.-Declaration of the Order of the House, that no Member is to take away a Bill, when committed, but the Clerk, or his Deputy, is to attend with it at the First Meeting of the Committee.-Bill, comprehending the Substance of a Clause offered to another Bill, ordered, 13 June.-Proceedings at Law, to be stayed, pending a Bill.-Blanks, left by Committees in Bills, filled up by the House, 11. 14. & 23 July. 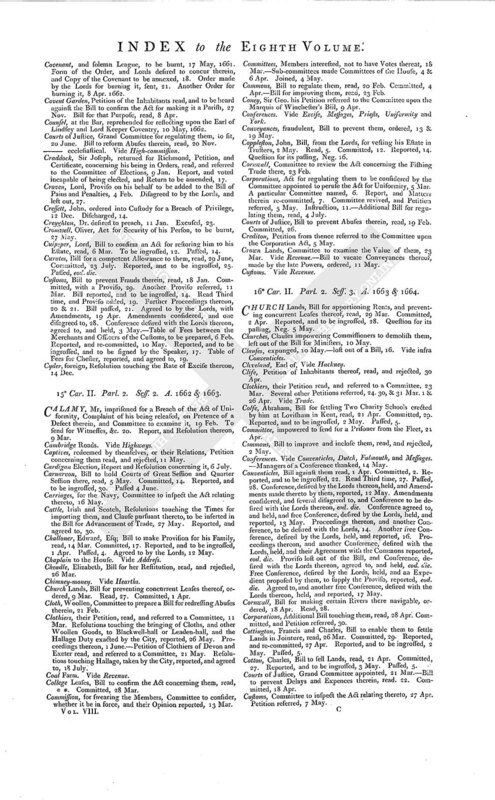 Clause, added by the Lords to a Bill, sent in Paper, and Notice to be taken thereof. Bishops Lands. Vide Church Lands. Bonds, entered into by the Loyalists. Vide Loyalists. Boston Election, Report and Resolution concerning it, 15 May. Brass Manufacture, Petition of Jacob Momma, and others, concerning it, read, and referred to a Committee, 21 May. Brewers, of London and Bristol, their Petitions read, and referred to the Committee for the Revenue, 30 Mar. Referred to the Sub-committee, 4 Apr. Petition of Brewers of Norwich read, and referred, eod. die.-of Brewers of Surry, referred, 30 Apr. Briscoe, Ellen, Bill for Payment of her Portion, read, 21 Feb. Committed. Reported, and to be ingrossed, 2 Apr. Passed. Agreed to by the Lords, with Amendments, 12 May. Amendments agreed to. Bristol, Earl of. Vide Temple. Buildings, new, Bill to prevent them about London, read, 5 June. Committed. Butchers, Bill to prevent their selling live sat Cattle, ordered, 12 May. Read. Committed, 5 June. Reported, and to be ingrossed. Passed, 3 July. Agreed to by the Lords. Butter, Committee to review the Act for packing it, 23 Feb.
Byron, Lord, Bill, from the Lords, to supply certain Evidences belonging to his Estate, 8 July. Read. Committed, and Petition of Sir John Masters read, and referred. 16° Car. II. Parl. 2. Sess. 3. A. 1663 & 1664. BEDFORD Level, Bill to explain the Act for draining it, read, 28 Mar. Committed, and Petition of Sir Andrew Henley, and others, referred, 4 Apr. Reported, and to be ingrossed, and Clause in behalf of Mr. Williams to be brought in, 3 May. Passed. Bedfordshire Election, Petition of Sir H. Chester concerning it, read, and referred to the Committee of Elections, 13 May. Bill, altered by a private Hand, and Committee to examine it, 11 May. Vide Vintners.-Proviso lost out of a Bill reported from a Conference. Vide Conventicles. Boston, Petition from thence read, and referred to the Committee for the Customs, 7 May. 16° & 17° Car. II. Parl. 2. Sess. 4. A. 1664. BEDFORD Level, Bill for better Government and draining thereof, read, 17 Dec.
Bedfordshire Election, Petition of Sir H. Chester concerning it, referred to the Committee of Elections, 25 Nov. Hearing put off, 6 Feb. Report and Resolution thereon.-Sum charged upon the County in the Bill of Assessment, 24 Jan.
Beresford, Christopher, Esq; Bill for Sale of Lands for Payment of his Debts, read, 14 Dec. Committed. Reported, and to be ingrossed, 6 Feb. Passed. Berks, County, Sum charged thereon in the Bill of Assessment, 24 Jan.
Berwick Elections Petition concerning it, and Mayor ordered to make the Return, 19 Jan. Another Petition read, and referred, 7 Feb. Hearing put off. Order discharged. -Joined with Northumberland in the Bill of Assessment, 26 Jan.
Bill to be extracted out of Two for the like Purposes, and a Blank to be left therein, to be filled up by the House, 13 Dec. -miscarried, Enquiry to be made about it, and a Copy to be read, 25 Jan.-brought in in loose Papers, withdrawn, and to be brought in again fair written, 7 Feb.-A Paper delivered at the Door, containing a Bill depending, with Reasons against it, complained of, and Committee to examine it.-List of Bills depending to be brought in by the Clerk, and House to direct the Order of proceeding in them, eod. die-Bill, from the Lords, laid aside, being to lay a Tax upon the People. Bricks, and Tiles, Bill for true making them, read, 19 Jan. Committed. Reported, and to be ingrossed, 21 Feb. Passed.-Another Bill for the like Purpose, read, and rejected, 25 Jan.
Bristol, City of, Sum charged thereon in the Bill of Assessment, 26 Jan. Bucks, County, Sum charged thereon in the Bill of Assessment, 24 Jan.
Burlington, alias Bridlington, Pier, Petition for a Bill to repair it, and Bill ordered, 25 Jan. Read. Committed, 8 Feb. Reported, and Neg. put upon the Question for ingrossing it. 17° Car. II. Parl. 2. Sess. 5. A. 1665. BILLS, depending in the last Session, Committee to peruse them, and present those of most Consequence, 11 Oct.
Blancquefort, Lewis, Bill to naturalize him, and others, read, 17 Oct. Committed. Reported, and to be ingrossed. Read Third time, and Certificates to be produced of the Persons, named therein, having received the Sacrament. Produced, and Bill passed. Agreed to by the Lords. 18° & 19° Car. II. Parl. 2. Sess. 6. A. 1666. BEDFORD Level, Petition of several Adventurers presented, and Bill to ascertain the Taxes thereon, read. Jan. Committed, and Petitions referred. Committee revived, and Serjeant Fountaine to be heard thereat. Bill reported, and Parties concerned to be heard at the Bar. Heard. Bill passed. 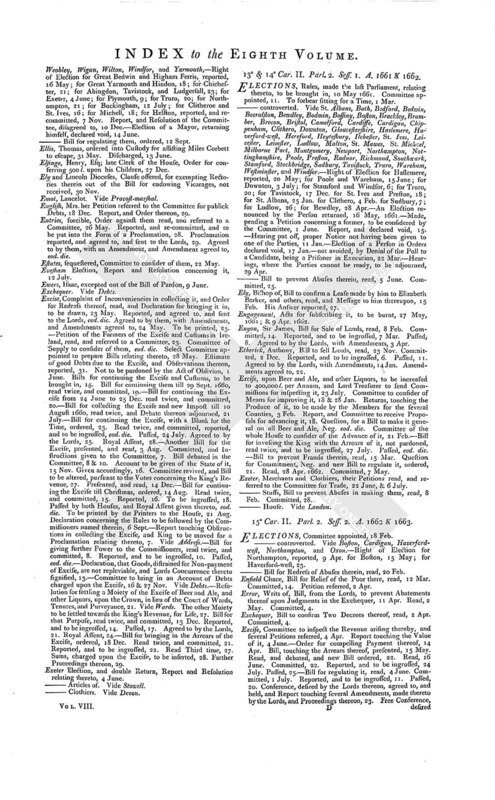 Berwick Election, Report and Resolution concerning it, 22 Nov.
Bills, depending in the last Session, Committee to peruse them, and to bring in those most necessary, 27 Sept.-To examine a Bill with the Amendments, and see that it be rightly ingrossed, 12 Dec.-to inspect the Bills depending, and report those of most Consequence.-Bill to be proceeded in, notwithstanding the Absence of a Trustee named therein, 19 Jan. -from the Lords, not to be committed, or read the Third time, being to lay a Charge upon the People, 25 Jan.
Bodvile, John, Esq; Bill for settling his Estate, read, 23 & 25 Oct. Petition concerning it, read, and Parties to be heard at the Bar. Day appointed for that Purpose. Heard, 19 & 21 Nov. Bill committed. Reported, and to be ingrossed. Passed, 10 Dec. Agreed to by the Lords, 2 Jan. Borders, Northern, Bill to continue a former Act for preventing Theft and Rapine thereon, read, 17 Nov. Committed. Reported, and to be ingrossed, 11 Dec. Passed. Bricks and Tiles, Bill to regulate the making of them, read, 26 Nov. Committed, 4 Dec.
Bristol Election, Committee to consider of it, 21 Sept. Report touching it, and Committee to hear the Merits of the Election, 6 Oct. Order, made by the Committee, for the Mayor's Attendance, agreed to by the House. Report and Resolution touching the Election, and Sheriff ordered into Custody. Return amended, and Sheriff discharged. CALAMY, Mr. desired to preach, 25 Apr. Thanked, and to print his Sermon, 1 May. Callicoes, to pay Excise, not being Linen, 24 Aug.
Calve-skins, Proviso touching them, tendered to the Bill of Ton age and Poundage, 24 July. Resolution relating thereto. Camelford, double Return, Report and Resolution concerning it, 5 May. Farther Report, and Election declared void, and new Writ ordered, 12 June. Report touching the other Election, and Resolution thereon, 3 Aug.
Candles, ordered to be brought in, 17. 21 & 27 Dec.
Canterbury, late Archbishop of, his Library to be taken Care of, 16 May. Captives in Turkey, Petition on their behalf read, and referred to a Committee, 12 June. 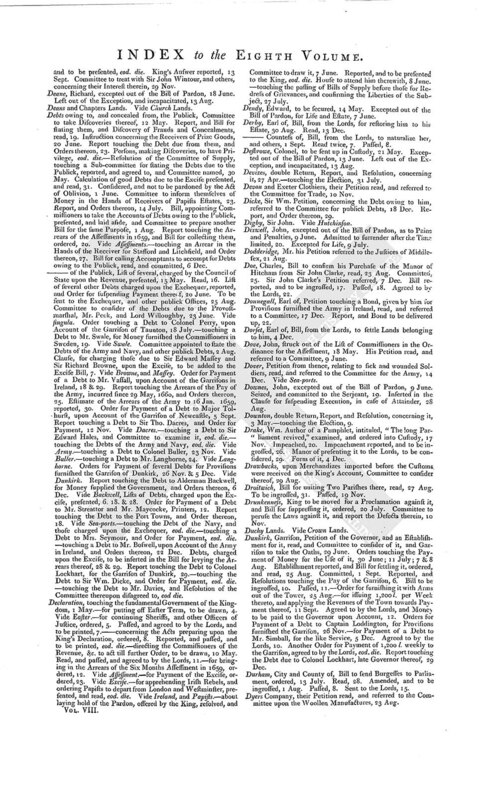 List of them presented, and referred, 28 July. Committee to examine, what Money was raised, and expended, for their Redemption, 3 Sept. To prepare a State of the Cases of the Persons claiming Interest therein. Petition to the King on their behalf presented, and read, and King's Recommendation thereof signified, 20 Dec. Report touching the Sums taken out of the Duty for their Redemption, and 10,000£. voted for Relief of those taken since 1642, and Bill, for that Purpose, ordered, eod. die. 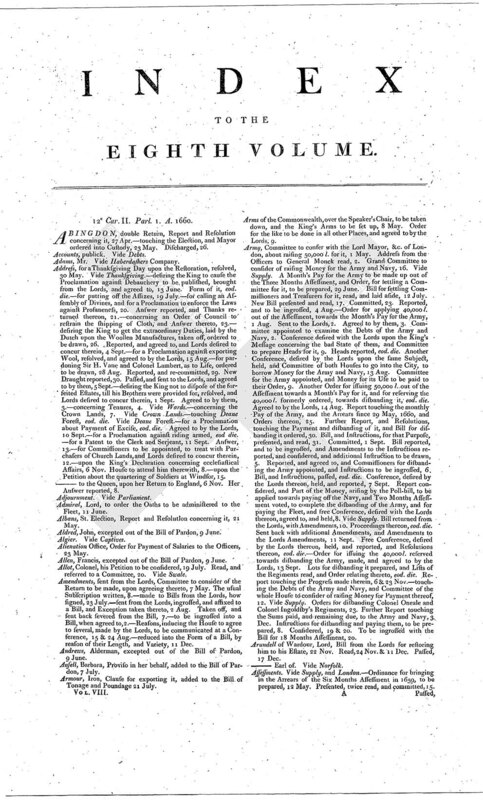 Petition on behalf of several taken before 1642 read, and Restriction on the Order taken off, 29 Dec.
Cardiffe, Election, Report and Resolution concerning it, 27 June. Cardigan, County, Petition of Freeholders read, and new Writs ordered, and Committee to examine the Miscarriage of the former, 16 May. Carew, John, one of the late King's Judges, Information given of his being suffered to escape, and Order thereon, 2 June, Apprehended, and to be brought up in Custody. Excepted out of the Bill of Pardon, as to Pains and Penalties. Committed to the Serjeant. His Name struck out of the List of those who surrendered, 28 Aug.
Carter, Sir John, his Petition read, and referred to the Commissioners, appointed to treat with the Purchasers of Church Lands, 17 Nov.
Cawley, Wm. excepted out of the Bill of Pardon, as to Pains and Penalties, 9 June. Excepted for Life, 9 July. Challenor, Thomas struck out of the List of Commissioners in the Ordinance for the Assessment, 18 May. Excepted out of the Bill of Pardon, 9 June. -, -James, excepted, 9 June. -, -Edmond, his Petition read, and Proviso, upon the Debate thereof, to be prepared, and tendered to the Bill of Attainder, 4 Dec.
Chamberlain, Lord, desired to clear the Banquetting-house, 9 Nov.
Chancey, Alexander, Under-sheriff of Middlesex, ordered into Custody for seizing Goods without Warrant, 16 June. Chaplain to the House, recommended to the King, 6 Sept. Allowance to be made him, 11 Sept. & 27 Dec.
Chapter Lands. Vide Church Lands. Charles I. late King, Votes concerning his Trial, and Journal of the High Court of Justice, erected for that Purpose, read, 12 May. Persons, who fat in Judgment, when Sentence was given against him, and the Two Persons employed in his Execution, to be secured, and Seven of the Judges to be excepted out of the Bill of Pardon, for Life and Estate. Vide Pardon. Bradshaw and others, dead, to be attainted. Vide Attainder. Further Powers given to the Serjeant, for apprehending Persons concerned in the King's Death. Orders for seizing the Persons and Estates of such as were fled, and for stopping the Ports, to prevent their Escape, and Lords desired to concur, therein. Conference, desired by the Lords thereon, agreed to. Their Reasons, for disagreeing to the said Orders, reported, and Committee to prepare Heads of a free Conference thereon. Heads reported, and Conference, held, and reported. Another Order for stopping the Ports, to prevent the Escape of the King's Judges. Goods belonging to them, seized, to be inventoried, and secured. Proclamation, requiring them to surrender, to be drawn, and presented to the King. Reported, and Lords desired to concur therein, 2 June. Agreed to by the Lords. Examinations taken in Ireland, relating to the King's Death, reported, and referred to a Committee.-touching the Person, who cut off his Head, reported. Committee to persue the Journal of the high Court of Justice, and inform themselves, what Persons, not sitting upon the 27th of January, sat at the Trial any of the preceding Days. Report, and Proceedings thereon. House informed of several having surrendered. Proviso, for excepting for Life and Estate such as did not surrender, added to the Bill of Pardon. Instrument under their Hands and Seals, and Journal of their Proceedings, to be sent to the Lords, at their Desire, 20 July. Sent. 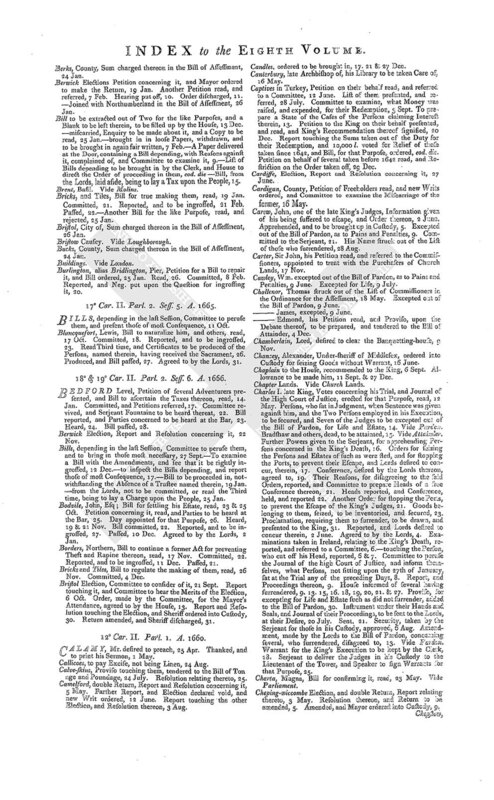 Security, taken by the Serjeant for those in his Custody, approved, 6 Aug. Amendment, made by the Lords to the Bill of Pardon, concerning several, who surrendered, disagreed to. Vide Pardon. Warrant for the King's Execution to be kept by the Clerk. Serjeant to deliver the Judges in his Custody to the Lieutenant of the Tower, and Speaker to sign Warrants for that Purpose. Charta, Magna, Bill for confirming it, read, 23 May. Vide Parliament. Cheping-wiccombe Election, and double Return, Report relating thereto, 3 May. Resolution thereon, and Return to be amended. Amended, and Mayor ordered into Custody. Chepstow Castle, to be demolished, 21 May. Chichester, double Return, Report and Resolution relating thereto, 3 May.-touching the Election, and Mayor ordered into Custody. Discharged. -, - Lord. Vide Donnegall. Christ's Hospital, Petition of Governors read, and Order for paying them a Sum given by Mr. Aldworth, 29 Dec.
Chubb, Henry, sent for in Custody, for permitting Mr. Carew to escape, 2 June. -, - Herbert, discharged out of Custody, 11 Sept.
Church Lands, Bill touching the Purchasers thereof, and other publick Lands, read, 4 May. Vide Lands.-Complaint of Mr. Ayloffe's seizing the Records concerning them, and Order thereon, 6 Aug. Further Order. Church, Anne and Mary, their Petition read, and referred to the Commissioners for Church Lands, 19 Nov.
Cinque-ports, Commissioners for them, named by the Lords to be inserted in the Poll-bill, disagreed to, 2 Aug. Conference thereon reported, and Amendment agreed to.-Clause for saving their Rights, tendered to the Bill for the Post Office, and rejected, 20 Dec.
Cirencester Election, Report and Resolution concerning it, 18 July. 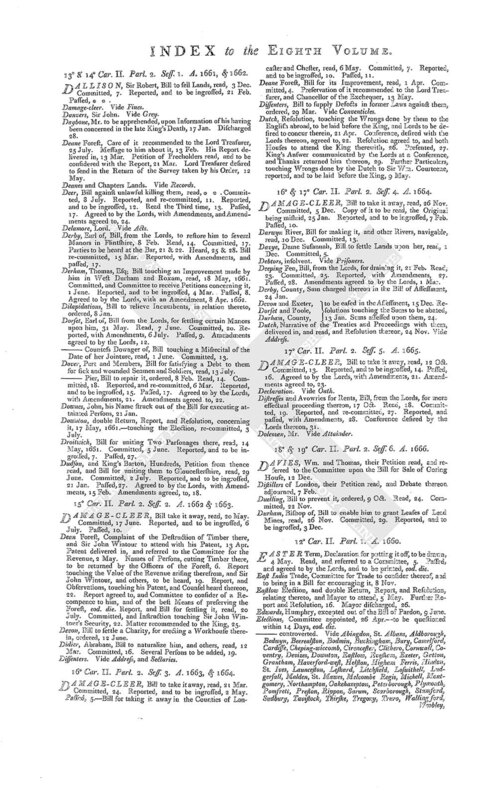 Clauses, added to Bills from the Lords, how signed, 23 July. Clement, Gregory, one of the late King's Judges, committed to the Tower, 26 May. Excepted out of the Bill of Pardon, 9 June. Clergis, Dr. to carry General Monck's Answer to the King's Letter, 2 May. His letter read. Clerk of the House chosen, 25 Apr. To attend the Attorneygeneral and King's Counsel with Journals, 7 Sept. His Attendance upon the House dispensed with, 16 Nov. Allowance to be made him for his Attendance, and the Charge of ingrossing publick Bills, 27 Dec. Vide Jessop. Clerk assistant, chosen, 25 Apr. Allowance to be made him, 11 & 13 Sept. & 27 Dec.
-, - of the Crown, attends the Lord Steward at the swearing of the Members, 4 June. To return a List of them, 6 Nov.
Clerke, Sir John. Vide Doe. Cleveland, Earl of, Bill, from the Lords, for Sale of his Estate, 17 Nov. Read. Committed. Reported, with Amendments, and passed, 24 Dec.
Clitheroe, Election, Report and Resolution concerning it, 16 July. Cloth, Woollen. Vide Address, and Woollen Manufactures. Clothiers. Vide Devon and Worcester. Cobbett, Colonel, to be examined about the killing of the Surrey Petitioners in 1648, 17 May. Excepted out of the Bill of Pardon, 18 June. Left out of the Exception, and incapacitated, 13 Aug.
Colchester, Petition from thence referred to the Committee for Woollen Manufactures, 27 July. Bill to regulate the Trade of Bay-making there, presented, and read, 15 Aug. Committed. Reported, and to be ingrossed. Passed, 1 Sept. Royal Assent.-Complaint of the stopping of their Bays and Sayes, for Non-payment of Aulnage, referred to the Committee for Trade, and Privy Council desired to take Order therein, 8 Nov. Colleges, and Hospitals, Bill for Confirmation of Leases and Grants thereof, ordered, 28 July. Read twice, and committed, 8 Aug. Reported, and Proceedings thereon. Other Amendments reported, and Bill to be ingrossed, and Committee to prepare a Clause touching the Universities. Further Amendments reported, and other Proceedings thereon. A Protestation to be drawn, and offered to the Members, about taking it off the Table. Further Amendments reported, and to be ingrossed with the Bill. Bill read Third time, and amended, and Debate thereon adjourned. Resumed, and Bill passed, 4 Sept. To be perused by a Committee, and several other Amendments reported, and Bill put again to the Question, and passed. Agreed to by the Lords, with Amendments, 19 Dec. Amendments considered, and Committee to draw Heads of a Conference upon some of them, disagreed to. Conference desired, and agreed to. Another Conference desired by the Lords, held, and reported. Amendments further considered. Free Conference desired with the Lords thereon, held, and their Agreement with the Commons reported. Committees, Notice of their sitting to be posted up at the Door of the House, 26 May.-Orders for Five to be a Quorum, 19. 23. 29 & 30 June; 31 July; and 14 Aug.-against the sitting of any between the rising of the House and their meeting in the Afternoon, 17 Dec.
Common-pleas, Bill to confirm certain Officers thereof, read, 28 Aug. Conferences. Vide Army, Charles I. Colleges, Ireland, King, Kingdom, Marriages, Messages, Ministers, Pardon, Parliament, Poll-bill, Queen, Seal, Supply, and Wards. Congnard, David, and others, their Petition read, and Bill to naturalize them, ordered, 29 June. Constable, Sir Wm. excepted out of the Bill of Pardon, 9 June. Cooke, John, Esq; one of the late King's Judges, to be secured, and brought in Custody, 14 May. His Examination read, and excepted out of the Bill of Pardon, for Life and Estate, 7 June. Corbett, Miles, Information given of his having escaped, and Persons assisting him sent for in Custody, 31 May. Excepted out of the Bill of Pardon, as to Pains and Penalties, 9 June. Excepted for Life, 9 July. Cornish Wool, or Hair, Clause for exempting Cloth, made thereof, from paying Custom on Exportation, tendered to the Bill of Tonage and Poundage, laid aside, 21 July. Cornwall Election, and double Return, Sheriff sent for in Custody, for not attending to give an Account thereof, 28 May. Report and Resolution relating thereto, and Sheriff censured, 12 July. Return amended, and Sheriff discharged. Ordered into Custody again, for not paying Fees, 15 Aug.
Covent Garden Precinct, Bill to make it parochial, read, 15 Aug. Committed. Reported, and re-committed, 8 Nov. To be ingrossed. Passed, 11 Dec. Agreed to by the Lords, with Amendments, and Amendments agreed to. Coventry, Election, Report concerning it, and adjudged void, 31 July. Council of State, President thereof to attend the Proclamation of the King, 8 May. Order for their providing Necessaries for his Reception, 10 Vide King. Particulars of the Sums, charged by them upon the several Treasuries, read, and approved, and Thanks given them for their Service. List of Persons committed, and released, by them, read, and Orders thereon. A new Mace to be provided for them. Courts of Justice, Committee to consider of Expedients for settling Proceedings therein, 1 May. Bill for making good Fines and Proceedings therein, presented, and read, 9 May. Committed. Reported, and to be ingrossed, 25 June. Passed, 9 July. Agreed to by the Lords, with Amendments, and Amendments considered, and referred to a Committee, 14 Aug. Reported, and agreed to, with Amendments to some of them, and an additional Clause, and referred back to the Committee. Report, and Proceedings thereon. Amendments agreed to by the Lords.-Another Bill, for Continuance of Process and judicial Proceedings, presented, read twice, and committed. Reported, and to be ingrossed. Amended, and passed. Agreed to by the Lords, with Amendments, and Amendments agreed to.- Bill for indemnifying certain Officers in Courts of Justice, read twice, and to be ingrossed, 17 Aug. Passed. Sent to the Lords. Craven, Lord, and others, Order against committing Waste upon their Estates, 5 May. Agreed to by the Lords. Creed, Major, Order touching his Wife's remaining with him, 21 May. Excepted out of the Bill of Pardon, 18 June. Left out of the Exception, and incapacitated, 13 Aug.
Cromwell, Oliver, to be attainted by Act of Parliament, 15 May. Vide Attainder. Order touching a Coach of his seized, but detained, upon Pretence of a Debt. His body to be taken up, and hanged at Tyburn, 4 Dec.
Crossland, Sir Jordan, Proviso concerning him, tendered to the Bill of Pardon, and rejected, 7 July. Crown and Sceptre, Order for providing them, and Lords Concurrence therein reported, 15 May. Persons to attend, to give an Account of them, eod. die. Crown Lands, not to be included in the Bill of Sales, 11 July. Resolutions of the Committee for the Revenue concerning them, reported, and agreed to, and Bill ordered thereupon, 4 Sept. Records concerning them, to be delivered to the proper Officers, and King to be desired not to dispose of them, but upon certain Terms. His Answer reported. Croxton, Colonel, excepted by the Lords out of the Bill of Pardon, 13 Aug. Clause for that Purpose, disagreed to. Not insisted on by the Lords. Crymes, Sir Thomas, Bill to restore him to his Estate, brought from the Lords, and read, 17 Dec. Read twice, and passed. Culpepper, Lord, Bill, from the Lords, for restoring him to his Honours, 27 Aug. Read, 7 Sept. Amended, and passed. -Proviso touching the Rectories of Randall and Littlewates, belonging to the late Lord Culpepper, added to the Bill of College Leases, 29 Aug.
Customs. Vide Excise.-Petition of the Surveyor-general referred to a Committee, 28 May.-Proviso touching those paid according to the Rates in April, 1660, tendered to the Bill of Tonage and Poundage, 23 July. Agreed to.-Commissioners not to permit any Goods to be entered till further Order.-Proviso, touching the Surveyor-general's Fees, tendered, and rejected.-Goods secreted, to avoid Payment of Customs, to be seized, and Committee to examine thereinto, 4 Aug.-A Table of Fees for the Officers to be prepared. -Another Petition of the Surveyor-general, touching Goods forcibly taken away, without Payment of Customs, read, and referred to a Committee, 19 Nov. Report, and Order thereon. 13° & 14° Car. II. Parl. 2. Seff. 1. A. 1661 & 1662. CAMELFORD Election, and double Return, Report and Resolution relating thereto, 16 May, 1661. Mayor ordered into Custody, for disobeying an Order of the Committee, 11 July. Discharged. Report touching the Election, and Petition dismissed, 26 Feb.
Campden, Lord, Bill, from the Lords, for settling a Messuage at Kensington upon him, 19 Mar. Read, 3 Apr. Committed. Reported, and passed. Candles, ordered to be brought in, 28 Jan. Captives, at Algier and Tunis, their Petition read, and referred to a Committee, 16 Jan. Report and Resolutions touching the Sums due to them from Mr. Langley and Mr. Harrington, and King to be moved therein, 3 Apr. Vide Address. King's Message concerning them, 7 May. Bill to revive the Duty for their Redemption, ordered. Cardiffe Election, Committee to consider of it, and of a Writ issued for a new Election, before the former was determined, 1 June. Report, and Orders thereon. Cardigan Election, Report concerning it, and adjudged void, 30 Apr. Carpenter, Mr. Chaplain to the House, desired to preach, 13 May, 1661. Thanked, & c. 27. Carriages, King desired to issue a Proclamation to restrain the Number of Horses drawing them, 29 July. Chancery, Masters of, Bill for settling their Fees, read, 10 June. Committed. Reported, and to be ingrossed. Passed. Agreed to by the Lords, 6 July. Chaplain to the House. Vide Address , and Carpenter. Charles I. late King, Instrument for erecting a high Court of Justice for his Trial, to be burnt, 27 May. Business touching the Persons concerned in his Death, not pardoned by the Act of Oblivion, to be considered, 26 June. Vide Regicides. Chippenham, double Return, Report and Resolution concerning it, 17 May, 1661. Farther Report, and Election declared void, and Bailiff sent for in Custody, 20 June. Discharged. Chriff's Hospital, Proviso relating thereto, added to the Poor Bill, 17 Feb. Adhered to, 15 May, 1662. Churches, Bill for levying Money for Repairs thereof, ordered, 17 May, 1661. Read. Committed, 14 June. Reported, and to be ingrossed, 4 July. Passed. Chute, Challoner, taken into Custody, for reflecting upon the House, 28 Jan. His Petition read, 7 Feb. Reprimanded, and discharged, eod. die. Clarke, Sir Simon and Sir John, Bill concerning them, read, 1 June. Committed. Reported, and to be ingrossed, and Committee to examine a Proviso, added thereto, 5 May. Clauses. Vide Amendments, and Bills. Clergy, Bill to repeal an Act for disabling them to exercise temporal Jurisdiction, ordered, 30 May. Presented, and read, 1 June. Committed. Reported, and to be ingrossed. Passed. Agreed to by the Lords, with Amendments, and Amendments agreed to. Clergymen incapable of being elected, 17 Jan. Vide Craddock. Cleveland, Earl of, Bill to confirm an Act concerning him, read, 25 June. Committed, and Petition of Mr. Gettings, and others, referred. Reported, and to be ingrossed, 6 July. Passed. Clitherce, Copyholders, Bill to confirm their Estates, read, 29 June. Committed, and Parties to have Notice, 6 July. Reported, and to be ingrossed. Passed, 29 Nov. Agreed to by the Lords, with Amendments, 29 Apr. Amendments agreed to, 5 May. -, - Election, Report and Resolution concerning it, 4 Feb.
Cloth, Yorkshire. Vide York, County of. Clothiers of Essex and Suffolk, their Petition, relating to the Bill for the Customs, read, and Clause thereon added, 19 Mar. -Another Petition of several Clothiers read, and referred to a Committee, 10 Apr. Report. Clothing Trade, Bill to regulate it, ordered, 27 May. Read, 20 Nov. Coin, Bill, from the Lords, to prevent melting it down, 18 Dec. Read, 14 Jan. Committed, 19 Feb. Reported, * * . Passed. 17 May, 1662. Colestreamers, Motion on their behalf, and Resolution thereon, and Lords to be desired to concur therein, 18 Dec. Conference, desired by the Lords thereon, held, and their Disagreement thereto reported. Collectors of publick Money, Bill for indemnifying them, read, 22 Jan. Read a Second time, and Committee to withdraw, and amend it. Reported, and to be ingrossed, eod. die. Passed, * * . Amendments, made thereto by the Lords, read, and agreed to, 16 May. Colleges, and Hospitals, Bill to confirm the Act concerning Leases thereof, ordered, 29 Nov. Read, 9 Dec. Committed. Reported, and to be ingrossed, 6 May. Colt, Geo. and Tho. Vide Scudamore, James. Committees, impowered to name Sub-committees, 16 May, & 6 Feb. 1661.-Three to be a Quorum, 20 May.-Members interested, net to vote thereat, 24 & 28 May; 5 July; & 26 Nov.-Impowered to fit in the House, 21 June.-to forbear farther Proceedings in a Bill, the Parties being to be heard at the Bar, 21 Feb.-Chairman of a Committee to deliver his Papers to another Member, 1 Mar.-Publick Committees revived, eod. die.-Five to be a Quorum, 20 Mar. Thanked, 16 Apr. 1662. Common-prayer, Book of, amended, and annexed to the Bill for Uniformity, 9 July. Returned from the Lords, with Amendments, made by the Convocation, 10 Apr. Amendments considered. Committee to examine them. Report, and Proceedings thereon. Proviso for translating it into Welch, if consistent with Law, to be brought in. Amendments, touching the recording of it, amended, and agreed to. Commons, Bill for better ordering them, read, 22 June. Committed, 23 Nov. Reported, and to be ingrossed, 12 Mar. Passed, 7 May. Commonwealth, Act, declaring it, to be burnt, 27 May, 1661. King's Messages about calling in the Money thereof, 28 Nov. & 16 Jan. Conferences. 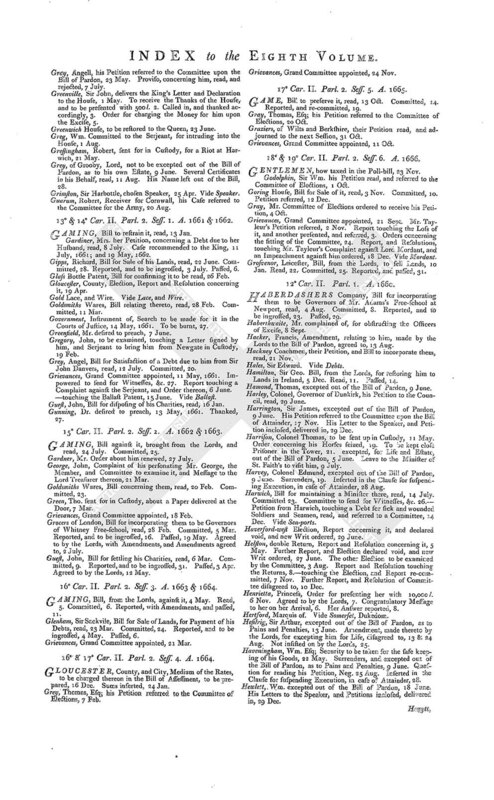 Vide Accomptants, Acts, Address, Advowsons, Amendments, Borders, Colestreamers, Conspiracy, Corporations, Customs, Highways, London, Loyalists, Messages, Militia, Norwich, Poor, Press, Quakers, Queen, Regicides, Scotland, Sheriffs, Uniformity, Westminster, and Witnesses.-Vote, approving the Proceedings of the Managers of a Conference, and one of them thanked, 29 July. Conscience, Court of, Bill to erect one for Southwark and Westminster, read, 6 Mar. Committed. 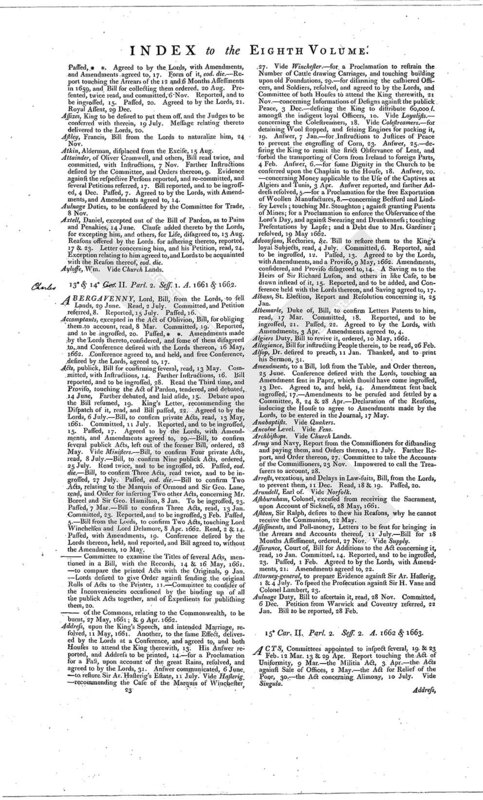 Conspiracy, Some Particulars of it communicated by the Lords at a Conference, and Committee of both Houses to examine it, 19 Dec. Conference desired by the Lords concerning the Committee, held, and reported, and Committee ordered to make their Report, 7 Jan. Report made, and Committee dissolved. Convocation, Proceedings upon their Amendments to the Book of Common Prayer, 14, 15, 16 & 28 Apr. To take Order for reverent Behaviour at Divine Service. Coppleston, John, Esq; Bill to sell Lands, read, 5 Dec. Committed. Reported, and to be ingrossed, 15 Feb. Question for its passing, Neg. 21.-Bill to confirm a Sale of Lands made by him, read, 7 Apr. Committed. Reported, and to be ingrossed. Passed. Cornwall, County of, Petition of several Inhabitants thereof, read, 15 June. -, - Duchy of, Bill to enable the King to let Leases thereof, read, 3 July. Committed. Reported, and to be ingrossed. Passed. Agreed to by the Lords, with Amendments, 9 Dec. Amendments agreed to. Corporations, Bill for well governing them, read, 19 June. Committed. Reported. Report considered. Parther considered, and Lists of Commissioners to be delivered in, and subscribed. King desired to name Commissioners for London, 1 July. Lists read, and Bill to be ingrossed. Passed. Agreed to by the Lords, with Amendments, and Amendments, except one, disagreed to, and Conference to be desired with the Lords thereon. Reasons to be offered thereat, reported, and agreed to, and to be entered in the Journal. Conference agreed to, and held, and another Conference, desired by the Lords, held, and reported, and Debate of the Bill adjourned till after the Recess. Another Conference, desired by the Lords, agreed to, and held, and several other Amendments, made by them to the Bill, reported, 17 Dec. Amendments considered, and agreed to, with Alterations, and Conference to be desired thereon. Conference agreed to, and held, and Alterations, made by the Commons, agreed to by the Lords, and Amendments to be ingrossed.-Additional Bill, for better regulating them, read, 9 May, 1662. Committed. Covenant, and solemn League, to be burnt, 17 May, 1661. Form of the Order, and Lords desired to concur therein, and Copy of the Covenant to be annexed. Order made by the Lords for burning it, sent. Another Order for burning it, 8 Apr. 1662. Covent Garden, Petition of the Inhabitants read, and to be heard against the Bill to confirm the Act for making it a Parish, 27 Nov. Bill for that Purpose, read, 8 Apr. Counsel, at the Bar, reprehended for reflecting upon the Earl of Lindsey and Lord Keeper Coventry, 10 May, 1662. Courts of Justice, Grand Committee for regulating them, to sit, 20 June. Bill to reform Abuses therein, read, 20 Nov.
-, - ecclesiastical. Vide High-commission. Craddock, Sir Joseph, returned for Richmond, Petition, and Certificate, concerning his being in Orders, read, and referred to the Committee of Elections, 9 Jan. Report, and voted incapable of being elected, and Return to be amended. Craven, Lord, Proviso on his behalf to be added to the Bill of Pains and Penalties, 4 Feb. Disagreed to by the Lords, and left out. Cressett, John, ordered into Custody for a Breach of Privilege, 12 Dec. Discharged. Creyghton, Dr. desired to preach, 11 Jan. Excused. Cromwell, Oliver, Act for Security of his Person, to be burnt, 27 May. Culpeper, Lord, Bill to confirm an Act for restoring him to his Estate, read, 6 Mar. To be ingrossed. Passed. Curates, Bill for a competent Allowance to them, read, 29 June, Committed, 23 July. Reported, and to be ingrossed. Passed, eod. die. Customs, Bill to prevent Frauds therein, read, 18 Jan. Committed, with a Proviso. Another Proviso referred, 11 Mar. Bill reported, and to be ingrossed. Read Third time, and Proviso added. Further Proceedings thereon. Bill passed. Agreed to by the Lords, with Amendments, 19 Apr. Amendments considered, and one disagreed to. Conference desired with the Lords thereon, agreed to, and held, 3 May.-Table of Fees between the Merchants and Officers of the Customs, to be prepared, 6 Feb. Reported, and re-committed, 10 May. Reported, and to be ingrossed, and to be signed by the Speaker. Table of Fees for Chester, reported, and agreed to. Cyder, foreign, Resolution touching the Rate of Excise thereon, 14 Dec.
15° Car. II. Parl. 2. Seff. 2. A. 1662 & 1663. CALAMY, Mr, imprisoned for a Breach of the Act of Uniformity, Complaint of his being released, on Pretence of a Defect therein, and Committee to examine it, 19 Feb. To send for Witnesses, & c. 20. Report, and Resolution thereon, 9 Mar. Captives, redeemed by themselves, or their Relations, Petition concerning them read, and rejected, 11 May. Cardigan Election, Report and Resolution concerning it, 6 July. Carnarvon, Bill to hold Courts of Great Session and Quarter Session there, read, 5 May. Committed. Reported, and to be ingrossed. Passed 4 June. Carriages, for the Navy, Committee to inspect the Act relating thereto, 16 May. Cattle, Irish and Scotch, Resolutions touching the Times for importing them, and Clause pursuant thereto, to be inserted in the Bill for Advancement of Trade, 27 May. Reported, and agreed to. Challoner, Edward, Esq; Bill to make Provision for his Family, read, 14 Mar. Committed. Reported, and to be ingrossed, 1 Apr. Passed. Agreed to by the Lords, 12 May. Chaplain to the House. Vide Address. Cheadle, Elizabeth, Bill for her Restitution, read, and rejected, 26 Mar. Church Lands, Bill for preventing concurrent Leases thereof, ordered, 9 Mar. Read. Committed, 1 Apr. Cloth, Woollen, Committee to prepare a Bill for redressing Abuses therein, 21 Feb.
Clothiers, their Petition, read, and referred to a Committee, 11 Mar. Resolutions touching the bringing of Cloths, and other Woollen Goods, to Blackwell-hall or Leaden-hall, and the Hallage Duty exacted by the City, reported, 26 May. Proceedings thereon, 1 June.-Petition of Clothiers of Devon and Exeter read, and referred to a Committee, 21 May. 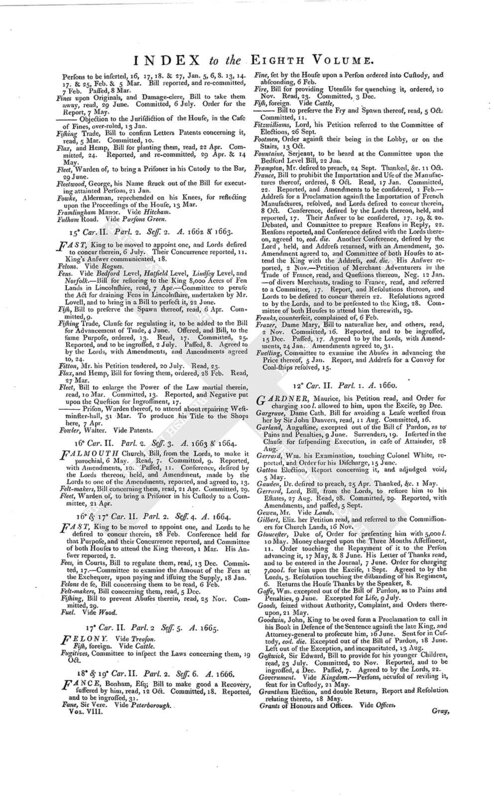 Resolutions touching Hallage, taken by the City, reported, and agreed to, 18 July. College Leases, Bill to confirm the Act concerning them, read, * *. Committed, 28 Mar. Commission, for swearing the Members, Committee to consider, whether it be in force, and their Opinion reported, 13 Mar. Committees, Members interested, not to have Votes thereat, 18 Mar.-Sub-committees made Committees of the House, 4 & 6 Apr. Joined, 4 May. Commons, Bill to regulate them, read, 20 Feb. Committed, 4 Apr.-Bill for improving them, read, 23 Feb.
Coney, Sir Geo. his Petition referred to the Committee upon the Marquis of Winchester's Bill, 9 Apr. Conferences. Vide Excise, Messages, Priefts, Uniformity and York. Conveyances, fraudulent, Bill to prevent them, ordered, 13 & 19 May. Coppleston, John, Bill, from the Lords, for vesting his Estate in Trustees, 2 May. Read. Committed. Reported. Question for its passing, Neg. 16. Cornwall, Committee to review the Act concerning the Fishing Trade there, 23 Feb. Corporations, Act for regulating them to be considered by the Committee appointed to peruse the Act for Uniformity, 5 Mar. A particular Committee named. Report, and Matters therein re-committed. Committee revived, and Petition referred, 5 May. Instruction.-Additional Bill for regulating them, read, 4 July. Courts of Justice, Bill to prevent Abuses therein, read, 19 Feb. Committed. 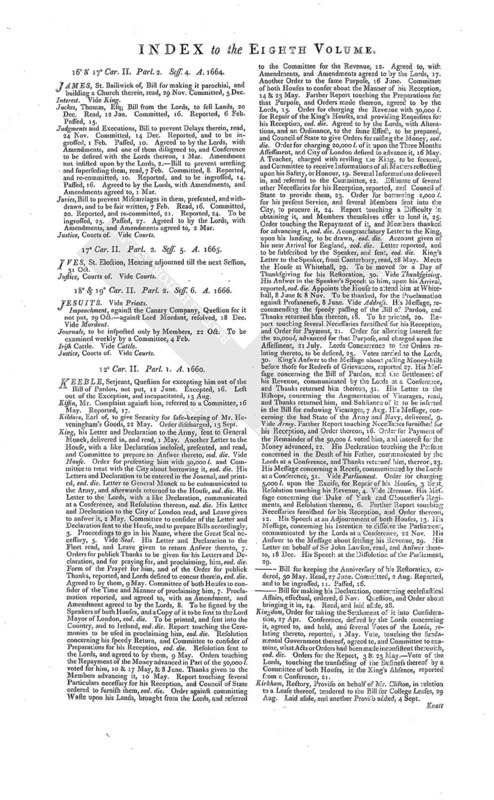 Crediton, Petition from thence referred to the Committee upon the Corporation Act, 5 May. Crown Lands, Committee to examine the Value of them, 23 Mar. Vide Revenue.-Bill to vacate Conveyances thereof, made by the late Powers, ordered, 11 May. 16° Car. II. Parl. 2. Seff. 3. A. 1663 & 1664. CHURCH Lands, Bill for apportioning Rents, and preventing concurrent Leases thereof, read, 29 Mar. Committed, 2 Apr. Reported, and to be ingrossed. Question for its passing, Neg. 5 May. Churches, Clauses impowering Commissioners to demolish them, left out of the Bill for Ministers, 10 May. Clauses, expunged, 10 May.-lost out of a Bill. Vide infra Conventicles. Cleveland, Earl of, Vide Hackney. Clife, Petition of Inhabitants thereof, read, and rejected, 30 Apr. Clothiers, their Petition read, and referred to a Committee, 23 Mar. Several other Petitions referred, 24. 30, & 31 Mar. 1 & 26 Apr. Vide Trade. Colfe, Abraham, Bill for settling Two Charity Schools erected by him at Lovisham in Kent, read, 21 Apr. Committed. Reported, and to be ingrossed, 2 May. Passed. Committee, impowered to send for a Prisoner from the Fleet, 21 Apr. Commons, Bill to improve and inclose them, read, and rejected, 2 May. Conferences. Vide Conventicles, Dutch, Falmouth, and Messages. -Managers of a Conference thanked, 14 May. Conventicles, Bill against them read, 1 Apr. Committed. Reported, and to be ingrossed. Read Third time. Passed. Conference, desired by the Lords thereon, held, and Amendments made thereto by them, reported, 12 May. Amendments considered, and several disagreed to, and Conference to be desired with the Lords thereon, eod. die. Conference agreed to, and held, and free Conference, desired by the Lords, held, and reported, 13 May. Proceedings thereon, and another Conference, to be desired with the Lords. Another free Conference, desired by the Lords, held, and reported. Proceedings thereon, and another Conference, desired with the Lords, held, and their Agreement with the Commons reported, eod. die. Proviso lost out of the Bill, and Conference, desired with the Lords thereon, agreed to, and held, eod. die. Free Conference, desired by the Lords, held, and an Expedient proposed by them, to supply the Proviso, reported, eod. die. Agreed to, and another free Conference, desired with the Lords thereon, held, and reported, 17 May. Cornwall, Bill for making certain Rivers there navigable, ordered, 18 Apr. Read. Corporations, Additional Bill touching them, read, 28 Apr. Committed, and Petition referred. Cottington, Francis and Charles, Bill to enable them to settle Lands in Jointure, read, 26 Mar. Committed. Reported, and re-committed, 27 Apr. Reported, and to be ingrossed, 2 May. Passed. Cotton, Charles, Bill to sell Lands, read, 21 Apr. Committed. Reported, and to be ingrossed, 3 May. Passed. Courts of Justice, Grand Committee appointed, 21 Mar.-Bill to prevent Delays and Expences therein, read. Committed, 18 Apr. Customs, Committee to inspect the Act relating thereto, 27 Apr. Petition referred, 7 May. CAMBRIDGE, County, and Isle of Ely, Sum charged upon them in the Bill of Assessment, 24 Jan. To be assessed separately, and Resolutions touching the Sums. Candles, Question for bringing them in, Neg. 28 Jan. & 15 Feb.
Canterbury, City of, joined with Kent in the Bill of Assessment, 24 Jan.
-, - Dean and Chapter of, Proviso in their behalf added to the Bill for Salt Marshes, 6 Feb.
Carr, Sir Robert, Bill for settling his Estate, read, 24 Jan. Committed. Order for a Witness to attend the Committee, 8 Feb. Bill reported. Lady Carr's Petition to be heard at the Bar, not assented to, and Bill to be ingrossed, eod. die. Passed, 16 Feb. Agreed to by the Lords, with Amendments. Amendments agreed to. Charles I. late King, Petition of his Creditors read, and referred to a Committee, 4 Feb. Reported, and Bill ordered for their Relief, 2 Mar. Chester, County, and City, to be joined in the Act of Assessment, and Resolution touching the Sum charged upon them, 24 Jan.
-, - Road. Vide Highways. Cholmley, Sir Hugh. Vide Mulgrave. Churches, Bill to unite them in Cities and Towns-corporate, read, 13 Feb. Committed. Reported, and to be ingrossed. Passed. Clause rased out of a Bill at the Third reading, 24 Feb.
Cloths, white, Bill to explain the Acts against Transportation of them, read, 28 Jan.
Comes, Richard, Bill to naturalize him, and others, read, 3 Dec. Committed. Reported, and to be ingrossed, 12 Jan. Passed, 8 Feb. Agreed to by the Lords, with Amendments. Amendments agreed to, 1 Mar. Cornwall, Bill for making divers Rivers therein navigable, read, 5 Dec. Committed. Reported, and to be ingrossed, 10 Feb. Passed.-County to be eased in the Assessment, 15 Dec. Resolution touching the Sum to be abated, 13 Jan. Sum assessed thereon. Costs, in trivial Actions, Bill concerning them, read, 7 Feb. Committed. Reported, and re-committed. Reported, and to be ingrossed. Passed. Coventry, City of, joined with Warwickshire in the Bill of Assessment, 26 Jan.
Courts of Justice, Committee to consider of Grievances therein, 6 Dec. Bill for regulating them, read. Committed, and Committee impowered to fever the Particulars therein. Three Bills brought in thereupon, 7 Feb. Vide Costs, Executions, and Juries. Craddock, Dr. desired to preach, 19 Jan. Thanked, & c. 31. Cumberland, County, Medium of the Rate to be charged thereon in the Bill of Assessment, reported, and agreed to, 16 Dec. Inserted, 24 Jan.
CATTLE, and Fish, foreign, Bill to prevent Importation thereof, read, 18 Oct. Committed. Reported, and to be ingrossed. Passed. Churches, in Towns-corporate, Bill, from the Lords, for uniting them, 17 Oct. Read. Committed. Reported, with Amendments. Passed. Amendments agreed to by the Lords. Conferences. Vide Distresses, King, Message, and Plague. Courts of Justice, Grand Committee appointed, 11 Oct.
CAMBRIDGE, Town, Clause for it to be added to the Bill relating to the Plague, 8 Nov. Vice-chancellor of the University to be named before the Mayor. Canary Company, Petition complaining of their Patent, read, and referred to a Committee, 1 Oct. Other Petitions referred. Report, and Patent voted a Grievance, and King to be moved to recall it, and Lords desired to concur therein. Message desiring them to consider the Votes relating thereto, 26 Nov. Their Answer, 12 Dec. Committee to draw up Reasons, to be offered at a Conference thereon. Patent sent for, and delivered in, and Committee revived. Reasons reported, and Conference to be desired. Committee to manage it. Another Petition read, and referred to the Committee, 8 Jan. Another Message to the Lords, to remind them of this Business. Candles to be brought in, 8 Nov.
Cattle, and Fish, Bill to prohibit the Importation of them, read, 22 Sept. Committed. Reported, and re-committed, 5 Oct. Reported, and to be ingrossed. Passed. Agreed to by the Lords, with Amendments, 24 Nov. Some of them disagreed to, and Proviso, touching Cattle to be given by Ireland for the Poor of London, committed. Reported, and disagreed to, 5 Dec. Committee to draw up Reasons, to be offered at a Conference upon the Amendments, 10, Reasons reported. Conference agreed to. Free Conference, desired by the Lords thereon, agreed to, and held, 2 Jan. Report touching a Petition to the King, concerning the Word "Nuisance" in the Bill, and Resolution to adhere thereto. Another free Conference desired with the Lords. Held. Another free Conference, desired by the Lords, held, and their Concurrence reported. Certiorari's, and Habeas Corpora, Bill to prevent Abuses thereby, read, 25 Sept. Committed, 12 Oct.
Chaplain, to the House, to preach at the Sacrament, 29 Oct. Thanked, 10 Dec.
Chester, City, Resolution touching the Sum to be charged thereon in the Bill of Assessment, 22 Dec.
Chimney-money, Committee to bring in an Estimate of the yearly Value thereof, and a Bill for Sale of it, and Committee of Supply, to consider of a Compensation to the King in lieu of it, 18 Oct. Matter considered in the Committee. Further considered, and Sub-committee appointed to consider of an Imposition upon sealed Paper, as Part of the Compensation for it. Estimate of the Value of it reported, and considered in the Committee. Further considered, and Resolution relating thereto. Order for bringing in the Bill for Sale of it.-Bill to regulate Abuses in collecting it, ordered, 17 Dec.
Cholmeley, Lady, her Petition, concerning Lord Norris's Bill, read, 24 Jan. Clause, converted into a Bill, 11 Dec. Vide Accounts. Clergy, to be taxed in the Poll-Bill for their Titles and Dignities, 24 Nov. Committee to insert the Rates upon them in the Bill. Cleveland, Earl of, Bill to enlarge the Time for Redemption of Mortgages made by him, read, 24 Sept. Committed, and Petition referred, 1 Oct. Reported, and to be ingrossed. Passed. Agreed to by the Lords, 10 Jan.
Coinage, Bill for Encouragement thereof, read, 28 Sept. Committed, 6 Oct. Reported, and to be ingrossed. Passed, 10 Nov. Amendments, made thereto by the Lords, considered, and agreed to, with Amendments, 19 Dec. Conference, desired by the Lords thereon, agreed to, and held, 2 Jan. Another Conference, desired by the Lords, held, and reported, and Amendments, as proposed by the Lords, agreed to. Bill sent to the Lords. Commission, for swearing the Members, read, 6 Nov. Committees, impowered to name Sub-committees, 28 Sept. & 23 Oct.-joined, 5 Oct. & 22 Dec.-Order, made by them, agreed to by the House. Commodities, native. Vide Manufactures.-foreign, Resolution for raising Part of the Supply by an Imposition thereon, 8 Nov. Conferences. Vide Accounts, Canary Company, Cattle, Coinage, France, Mordaunt, Plague, and Poll-bill.-A free Conference denied by the Lords, 5 Feb. Vide Mordaunt. Courts of Justice, Grand Committee appointed, 21 Sept.
DACRES, Sir Tho. his Petition referred to the Committee for publick Debts, 7 Aug. Report touching the Debt due to him, and Order for Payment, and Lords desired to concur therein, 12 Nov. Agreed to by the Lords, with Amendments, and Amendments agreed to, 10 Dec.
Dallison, Sir Robert, Bill to sell Lands, read, 4 Aug. Committed. Danvers, Sir John, excepted out of the Bill of Pardon, 9 June. Case of his Heirs referred to the Committee upon the Bill of Attainder, 9 Nov.
-, - Robert, Esq; Committee to consider of his Election, 7 July. Darnall, Ralph, Esq; chosen Clerk-Assistant, 25 Apr. Vide Clerk-Assistant. His Petition read, 21 Dec. Case referred to the Commissioners for ecclesiastical Lands. Davies, John, his Petition read, and referred to the Committee for publick Debts, 18 Dec. Report, and Resolution of the Committee thereon disagreed to. Dean Forest, Bill for Preservation thereof, read, 10 Aug. Committed, and Petition of Inhabitants referred.-King desired to give Order for preserving the Timber therein, and Committee to draw an Address thereupon, 7 Sept. Address reported, and to be presented, eod. die. King's Answer reported, 13 Sept. Committee to treat with Sir John Wintour, and others, concerning their Interest therein, 29 Nov.
Deane, Richard, excepted out of the Bill of Pardon, 18 June. Left out of the Exception, and incapacitated, 13 Aug.
Deans and Chapters Lands. Vide Church Lands. Debts owing to, and concealed from, the Publick, Committee to take Discoveries thereof, 12 May. Report, and Bill for stating them, and Discovery of Frauds and Concealments, read. Instruction concerning the Receivers of Prize Goods, 20 June. Report touching the Debt due from them, and Orders thereon. Persons, making Discoveries, to have Privilege, eod. die.-Resolution of the Committee of Supply, touching a Sub-committee for stating the Debts due to the Publick, reported, and agreed to, and Committee named, 30 May. Calculation of good Debts due to the Excise presented, and read. Considered, and not to be pardoned by the Act of Oblivion, 1 June. Committee to inform themselves of Money in the Hands of Receivers of Papists Estates. Report, and Orders thereon, 14 July. Bill, appointing Commissioners to take the Accounts of Debts owing to the Publick, presented, and laid aside, and Committee to prepare another Bill for the same Purpose, 1 Aug. Report touching the Arrears of the Assessments in 1659, and Bill for collecting them, ordered. Vide Assessments.-touching an Arrear in the Hands of the Receiver for Stafford and Litchfield, and Order thereon. Bill for calling Accomptants to accompt for Debts owing to the Publick, read, and committed, 6 Dec.
-, -of the Publick, List of several, charged by the Council of State upon the Revenue, presented, 15 May. Read. List of several other Debts charged upon the Exchequer, reported, and Order for suspending Payment thereof, 20 June. To be sent to the Exchequer, and other publick Offices, 25 Aug. Committee to consider of the Debts due to the Provostmarshal, Mr. Peck, and Lord Willoughby, 23 June. Vide singula. Order touching a Debt to Colonel Perry, upon Account of the Garrison of Taunton, 18 July.-touching a Debt to Mr. Swale, for Money furnished the Commissioners in Sweden. Vide Swale. Committee appointed to state the Debts of the Army and Navy, and other publick Debts, 2 Aug. Clause, for charging those due to Sir Edward Massey and Sir Richard Browne, upon the Excise, to be added to the Excise Bil. Vide Browne, and Massey. Order for Payment of a Debt to Mr. Vassall, upon Account of the Garrisons in Ireland. Report touching the Arrears of the Pay of the Army, incurred since 29 May, 1660, and Orders thereon. Estimate of the Arrears of the Army to 16 Jan. 1659, reported. Order for Payment of a Debt to Major Tolhurst, upon Account of the Garrison of Newcastle, 5 Sept. Report touching a Debt to Sir Tho. Dacres, and Order for Payment, 12 Nov. Vide Dacres.-touching a Debt to Sir Edward Hales, and Committee to examine it, eod. die.- touching the Debts of the Army and Navy, eod. die. Vide Army.-touching a Debt to Colonel Buller, 23 Nov. Vide Buller.-touching a Debt to Mr. Langhorne. Vide Langhorne. Orders for Payment of several Debts for Provisions furnished the Garrison of Dunkirk, 26 Nov. & 5 Dec. Vide Dunkirk. Report touching the Debt to Alderman Backwell, for Money supplied the Government, and Orders thereon, 6 Dec. Vide Backwell, Lists of Debts, charged upon the Excise, presented. Order for Payment of a Debt to Mr. Streattor and Mr. Maycocke, Printers. Report touching the Debt to the Port Towns, and Order thereon. Vide Sea-ports.-touching the Debt of the Navy, and those charged upon the Exchequer, eod. die.-touching a Debt to Mrs. Seymour, and Order for Payment, eod. die. -touching a Debt to Mr. Boswell, upon Account of the Army in Ireland, and Orders thereon, 22 Dec. Debts, charged upon the Excise, to be inserted in the Bill for levying the Arrears thereof. Report touching the Debt to Colonel Lockhart, for the Garrison of Dunkirk.-touching the Debt to Sir Wm. Dicke, and Order for Payment, eod. die. -touching the Debt to Mr. Davies, and Resolution of the Committee thereupon disagreed to, eod die. Declaration, touching the fundamental Government of the Kingdom, 1 May.-for putting off Easter Term, to be drawn. Vide Easter.-for continuing Sheriffs, and other Officers of Justice, ordered. Passed, and agreed to by the Lords, and to be printed.-concerning the Acts preparing upon the King's Declaration, ordered. Reported, and passed, and to be printed, eod. die.-directing the Commissioners of the Revenue, & c. to act till further Order, to be drawn, 10 May. Read, and passed, and agreed to by the Lords.-for bringing in the Arrears of the Six Months Assessment in 1659, ordered. Vide Assessment.-for Payment of the Excise, ordered. Vide Excise.-for apprehending Irish Rebels, and ordering Papists to depart from London and Westminster, presented, and read, eod. die. Vide Ireland, and Papists.-about laying hold of the Pardon, offered by the King, resolved, and Committee to draw it, 7 June. Reported, and to be presented to the King, eod. die. House to attend him therewith, 8 June. -touching the passing of Bills of Supply before those for Redress of Grievances, and confirming the Liberties of the Subject, 27 July. Dendy, Edward, to be secured, 14 May. Excepted out of the Bill of Pardon, for Life and Estate, 7 June. Dendy, Earl of, Bill, from the Lords, for restoring him to his Estate, 30 Aug. Read, 13 Dec.
-, -Countess of, Bill, from the Lords, to naturalize her, and others, 1 Sept. Read twice. Passed. Desbrowe, Colonel, to be sent up in Custody, 21 May. Excepted out of the Bill of Pardon, 13 June. Left out of the Exception, and incapacitated, 13 Aug.
Devizes, double Return, Report, and Resolution, concerning it, 27 Apr.-touching the Election, 31 July. Devon and Exeter Clothiers, their Petition read, and referred to the Committee for Trade, 10 Nov.
Dicke, Sir Wm. Petition, concerning the Debt owing to him, referred to the Committee for publick Debts, 18 Dec. Report, and Order thereon. Digby, Sir John. Vide Hutchinson. Dixwell, John, excepted out of the Bill of Pardon, as to Pains and Penalties, 9 June. Admitted to surrender after the Time limited. Excepted for Life, 9 July. Dodderidge, Mr. his Petition referred to the Justices of Middlesex, 21 Aug.
Doe, Charles, Bill to confirm his Purchase of the Manor of Hitcham from Sir John Clarke, read, 23 Aug. Committed. Sir John Clarke's Petition referred, 7 Dec. Bill reported, and to be ingrossed. Passed. Agreed to by the Lords. Donnegall, Earl of, Petition touching a Bond, given by him for Provisions furnished the Army in Ireland, read, and referred to a Committee, 17 Dec. Report, and Bond to be delivered up. Dorset, Earl of, Bill, from the Lords, to settle Lands belonging to him, 4 Dec.
Dove, John, struck out of the List of Commissioners in the Ordinance for the Assessment, 18 May. His Petition read, and referred to a Committee, 9 June. Dover, Petition from thence, relating to sick and wounded Soldiers, read, and referred to the Committee for the Army, 14 Dec. Vide Sea-ports. Downes, John, excepted out of the Bill of Pardon, 9 June. Seized, and committed to the Serjeant. Inserted in the Clause for suspending Execution, in case of Attainder, 28 Aug.
Downton, double Return, Report, and Resolution, concerning it, 3 May.-touching the Election. Drake, Wm. Author of a Pamphlet, intituled, "The long Parliament revived," examined, and ordered into Custody, 17 Nov. Impeached. Impeachment reported, and to be ingrossed. Manor of presenting it to the Lords, to be considered. Form of it, 4 Dec. Drawbacks, upon Merchandizes imported before the Customs were received on the King's Account, Committee to consider thereof, 29 Aug.
Droitwich, Bill for uniting Two Parishes there, read, 27 Aug. To be ingrossed. Passed, 19 Nov.
Drunkenness, King to be moved for a Proclamation against it, and Bill for suppressing it, ordered, 20 July. Committee to peruse the Laws against it, and report the Defects therein, 10 Nov.
Duchy Lands. Vide Crown Lands. Dunkirk, Garrison, Petition of the Governor, and an Establishment for it, read, and Committee to consider of it, and Garrison to take the Oaths, 29 June. Orders touching the Payment of Money for the Use of it, 30 June; 11 July; 7 & 8 Aug. Establishment reported, and Bill for settling it, ordered, and read, 25 Aug. 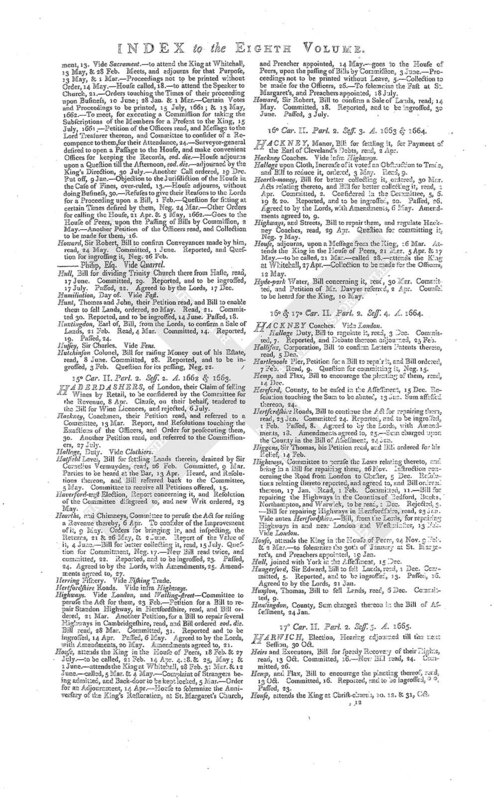 Committed, 1 Sept. Reported, and Resolutions touching the Pay of the Garrison. Bill to be ingrossed. Passed.-Order for furnishing it with Arms out of the Tower, 25 Aug.-for issuing 1,200£. per Week thereto, and applying the Revenues of the Town towards Payment thereof, 11 Sept. Agreed to by the Lords, and Money to be paid to the Governor upon Account. Orders for Payment of a Debt to Captain Loddington, for Provisions furnished the Garrison, 26 Nov.-for Payment of a Debt to Mr. Simball, for the like Service, 5 Dec. Agreed to by the Lords. Another Order for Payment of 1,200£. weekly to the Garrison, agreed to by the Lords, eod. die. Report touching the Debt due to Colonel Lockhart, late Governor thereof, 29 Dec.
Durham, City and County of, Bill to send Burgesses to Parliament, ordered, 13 July. Read. Amended, and to be ingrossed, 1 Aug. Passed. Sent to the Lords. Dyers Company, their Petition read, and referred to the Committee upon the Woollen Manufactures, 23 Aug.
13° & 14° Car. II. Parl. 2. Sess. 1. A. 1661, & 1662. DALLISON, Sir Robert, Bill to sell Lands, read, 3 Dec. Committed. Reported, and to be ingrossed, 21 Feb. Passed, * * . Danvers, Sir John. Vide Grey. Daybone, Mr. to be apprehended, upon Information of his having been concerned in the late King's Death, 17 Jan. Discharge. Deane Forest, Care of it recommended to the Lord Treasurer, 25 July. Message to him about it, 13 Feb. His Report delivered in, 13 Mar. Petition of Freeholders read, and to be considered with the Report, 21 Mar. Lord Treasurer desired to send in the Return of the Survey taken by his Order, 12 May. Deanes and Chapters Lands. Vide Records. Deer, Bill against unlawful killing them, read, * * . Committed, 8 July. Reported, and re-committed. Reported, and to be ingrossed. Read the Third time. Passed. Agreed to by the Lords, with Amendments, and Amendments agreed to. Derby, Earl of, Bill, from the Lords, to restore him to several Manors in Flintshire, 8 Feb. Read. Committed. Parties to be heard at the Bar. Heard. Bill re-committed, 15 Mar. Reported, with Amendments, and passed. Derham, Thomas, Esq; Bill touching an Improvement made by him in West Durham and Roxam, read, 18 May, 1661. Committed, and Committee to receive Petitions concerning it, 1 June. Reported, and to be ingrossed, 4 Mar. Passed. Agreed to by the Lords, with an Amendment, 8 Apr. 1662. Dilapidations, Bill to relieve Incumbents, in relation thereto, ordered, 8 Jan.
Dorset, Earl of, Bill from the Lords, for settling certain Manors upon him, 31 May. Read, 7 June. Committed. Reported, with Amendments, 6 July. Passed. Amendments agreed to by the Lords. -, -Countess Dowager of, Bill touching a Misrecital of the Date of her Jointure, read, 1 June. Committed. Dover, Port and Members, Bill for satisfying a Debt to them for sick and wounded Seamen and Soldiers, read, 13 July. -, -Pier, Bill to repair it, ordered, 8 Feb. Read. Committed. Reported, and re-committed, 6 Mar. Reported, and to be ingrossed. Passed. Agreed to by the Lords, with Amendments. Amendments agreed to. Downes, John, his Name struck out of the Bill for executing attainted Persons, 21 Jan.
Downton, double Return, Report, and Resolution, concerning it, 17 May, 1661.-touching the Election, re-committed, 3 July. Droitwich, Bill for uniting Two Parsonages there, read, 14 May, 1661. Committed, 5 June. Reported, and to be ingrossed. Passed. Dudson, and King's Barton, Hundreds, Petition from thence read, and Bill for uniting them to Gloucestershire, read, 29 June. Committed, 2 July. Reported, and to be ingrossed, 21 Jan. Passed. Agreed to by the Lords, with Amendments, 15 Feb. Amendments agreed, to. DAMAGE-CLEER Bill take it away, read, 20 May. Committed, 17 June. Reported, and to be ingrossed, 6 July. Passed. Dean Forest, Complaint of the Destruction of Timber there, and Sir John Wintour to attend with his Patent, 13 Apr. Patent delivered in, and referred to the Committee for the Revenue, 2 May. Names of Persons, cutting Timber there, to be returned by the Officers of the Forest. Report touching the Value of the Revenue arising therefrom, and Sir John Wintour, and others, to be heard. Report, and Observations, touching his Patent, and Counsel heard thereon. Report agreed to, and Committee to consider of a Recompence to him, and of the best Means of preserving the Forest, eod. die. Report, and Bill for settling it, read, 20 July. Committed, and Instruction touching Sir John Wintour's Security. Matter recommended to the King. Devon, Bill to settle a Charity, for erecting a Workhouse therein, ordered, 12 June. Didier, Abraham, Bill to naturalize him, and others, read, 12 Mar. Committed. Several Persons to be added. Dissenters. Vide Address, and Sectaries. 16° Car. II. Parl. 2. Seff. 3. A. 1663, & 1664. DAMAGE-CLEER, Bill to take it away, read, 21 Mar. Committed. Reported, and to be ingrossed, 2 May. Passed.-Bill for taking it away in the Counties of Lancaster and Chester, read, 6 May. Committed. Reported, and to be ingrossed. Passed. Deane Forest, Bill for its Improvement, read, 1 Apr. Committed. Preservation of it recommended to the Lord Treasurer, and Chancellor of the Exchequer, 13 May. Dissenters, Bill to supply Defects in former Laws against them, ordered, 29 Mar. Vide Conventicles. Dutch, Resolution, touching the Wrongs done by them to the English abroad, to be laid before the King, and Lords to be desired to concur therein, 21 Apr. Conference, desired with the Lords thereon, agreed to. Resolution agreed to, and both Houses to attend the King therewith. Presented. King's Answer communicated by the Lords at a Conference, and Thanks returned him thereon. Farther Particulars, touching Wrongs done by the Dutch to Sir Wm. Courteene, reported, and to be laid before the King, 9 May. DAMAGE-CLEER, Bill to take it away, read, 26 Nov. Committed, 5 Dec. Copy of it to be read, the Original being mislaid, 25 Jan. Reported, and to be ingrossed, 7 Feb. Passed. Darwyn River, Bill for making it, and other Rivers, navigable, read, 10 Dec. Committed. Davye, Dame Susannah, Bill to settle Lands upon her, read, 1 Dec. Committed. Deeping Fen, Bill, from the Lords, for draining it, 21 Feb. Read. Committed. Reported, with Amendments. Passed. Amendments agreed to by the Lords, 1 Mar. Derby, County, Sum charged thereon in the Bill of Assessment, 24 Jan.
Devon and Exeter, Dorset and Poole, Durham, County, to be eased in the Assessment, 15 Dec. Resolutions touching the Sums to be abated, 13 Jan. Sums assessed upon them. Dutch, Narrative of the Treaties and Proceedings with them, delivered in, and read, and Resolution thereon, 24 Nov. Vide Address. 17° Car. II. Parl. 2. Seff. 5. A. 1665. DAMAGE-CLEER, Bill to take it away, read, 12 Oct. Committed. Reported, and to be ingrossed. Passed. Agreed to by the Lords, with Amendments. Amendments agreed to. Distresses and Avowries for Rents, Bill, from the Lords, for more effectual proceeding thereon, 17 Oct. Read. Committed. Reported, and re-committed. Reported, and passed, with Amendments. Conference desired by the Lords thereon. DAVIES, Wm. and Thomas, their Petition read, and referred to the Committee upon the Bill for Sale of Goring House, 12 Dec.
Distillers of London, their Petition read, and Debate thereon adjourned, 7 Feb.
Duelling, Bill to prevent it, ordered, 9 Oct. Read. Committed, 22 Nov.
Durham, Bishop of, Bill to enable him to grant Leases of Lead Mines, read, 26 Nov. Committed. Reported, and to be ingrossed, 3 Dec.
EASTER Term, Declaration for putting it off, to be drawn, 4 May. Read, and referred to a Committee. Passed, and agreed to by the Lords, and to be printed, eod. die. East India Trade, Committee for Trade to consider thereof, and to bring in a Bill for encouraging it, 8 Nov.
Eastlow Election, and double Return, Report, and Resolution, relating thereto, and Mayor to attend, 5 May. Further Report and Resolution. Mayor discharged. Edwards, Humphry, excepted out of the Bill of Pardon, 9 June. Elections, Committee appointed, 26 Apr.-to be questioned within 14 Days, eod. die. -, - controverted. Vide Abingdon, St. Albans, Aldborough, Bedwyn, Beerealston, Bodmin, Buckingham, Bury, Camelford, Cardiffe, Cheping-wiccomb, Cirencester, Clithero, Cornwall, Coventry, Devizes, Downton, Eastlow, Evesham, Exeter, Gatton, Grantham, Haverford-west, Helston, Higham Ferris, Hindon, St. Ives, Launceston, Leskard, Litchfield, Loswithell, Ludgersall, Malden, St. Mawes, Melcombe Regis, Michell, Montgomery, Northampton, Oakehampton, Peterborough, Plymouth, Pomfrett, Preston, Rippon, Sarum, Scarborough, Stamford, Sudbury, Tavistock, Thirske, Tregony, Truro, Wallingford, Weobley, Wigan, Wilton, Windsor, and Yarmouth,-Right of Election for Great Bedwin and Higham Ferris, reported, 16 May; for Great Yarmouth and Hindon; for Chiches- ter; for Abingdon, Tavistock, and Ludgerfall; for Exeter, 4 June; for Plymouth; for Truro; for North- ampton; for Buckingham, 12 July; for Clitheroe and St. Ives; for Michell; for Helston, reported, and re- committed, 7 Nov. Report, and Resolution of the Commit- tee, disagreed to, 10 Dec.-Election of a Mayor, returning himself, declared void, 14 June. -, -Bill for regulating them, ordered, 12 Sept.
Ellis, Thomas, ordered into Custody for assisting Miles Corbett to escape, 31 May. Discharged, 13 June. Elsinge, Henry, Esq; late Clerk of the House, Order for con- ferring 500£. upon his Children, 27 Dec.
Ely and Lincoln Dioceses, Clause offered, for exempting Recto- ries therein out of the Bill for endowing Vicarages, not received, 30 Nov.
English, Mrs. her Petition referred to the Committee for publick Debts, 18 Dec. Report, and Order thereon. Entries, forcible, Order against them read, and referred to a Committee, 26 May. Reported, and re-committed, and to be put into the Form of a Proclamation. Proclamation reported, and agreed to, and sent to the Lords. Agreed to by them, with an Amendment, and Amendment agreed to, eod. die. Estates, sequestered, Committee to consider of them, 22 May. Evesham Election, Report and Resolution concerning it, 12 July. Ewers, Isaac, excepted out of the Bill of Pardon, 9 June. Excise, Complaint of Inconveniencies in collecting it, and Order for Redress thereof, read, and Declaration for bringing it in, to be drawn, 23 May. Reported, and agreed to, and sent to the Lords, eod. die. Agreed to by them, with Amendments, and Amendments agreed to, 24 May. To be printed.-Petition of the Farmers of the Excise and Customs in Ire- land, read, and referred to a Committee. Committee of Supply to consider of them, eod. die. Select Committee ap- pointed to prepare Bills relating thereto, 28 May. Estimate of good Debts due to the Excise, and Observations thereon, reported. Not to be pardoned by the Act of Oblivion, 1 June. Bills for continuing the Excise and Customs, to be brought in. Bill for continuing them till 29 Sept. 1660, read twice, and committed.-Bill for continuing the Ex- cise from 24 June to 25 Dec. read twice, and committed.-Bill for collecting the Excise and new Impost till 10 August 1660, read twice, and Debate thereon adjourned, 21 July.-Bill for continuing the Excise, with a Blank for the Time, ordered. Read twice, and committed, reported, and to be ingrossed, eod. die. Passed, 24 July. Agreed to by the Lords. Royal Assent.-Another Bill for the Excise, presented, and read, 3 Aug. Committed, and In- structions given to the Committee. Bill debated in the Committee. Account to be given of the State of it, 15 Nov. Given accordingly. Committee revived, and Bill to be altered, pursuant to the Votes concerning the King's Re- venue. Presented, and read, 14 Dec.-Bill for continu- ing the Excise till Christmas, ordered, 14 Aug. Read twice, and committed. Reported. To be ingrossed. Passed by both Houses, and Royal Assent given thereto, eod. die. To be printed by the Printers to the House, 21 Aug. Declaration concerning the Rules to be followed by the Com- missioners named therein, 6 Sept.-Report touching Obstruc- tions in collecting the Excise, and King to be moved for a Proclamation relating thereto. Vide Address.-Bill for giving further Power to the Commissioners, read twice, and committed. Reported, and to be ingrossed. Passed, eod. die.-Declaration, that Goods, distrained for Non-payment of Excise, are not repleviable, and Lords Concurrence thereto signified.-Committee to bring in an Account of Debts charged upon the Excise, 16 & 27 Nov. Vide Debts.-Reso- lution for settling a Moiety of the Excise of Beer and Ale, and other Liquors, upon the Crown, in lieu of the Court of Wards, Tenures, and Purveyance. Vide Wards. The other Moiety to be settled towards the King's Revenue, for Life. Bill for that Purpose, read twice, and committed, 13 Dec. Reported, and to be ingrossed. Passed. Agreed to by the Lords. Royal Assent.-Bill for bringing in the Arrears of the Excise, ordered, 18 Dec. Read twice, and committed. Reported, and to be ingrossed. Read Third time. Sums, charged upon the Excise, to be inserted. Farther Proceedings thereon. Exeter Election, and double Return, Report and Resolution relating thereto, 4 June. -, -Articles of. Vide Stowell. 13° & 14° Car. II. Parl. 2. Sess. 1. A. 1661 & 1662. ELECTIONS, Rules, made the last Parliament, relating thereto, to be brought in, 10 May 1661. Committee ap- pointed. To forbear sitting for a Time, 1 Mar. -, -controverted. Vide St. Albans, Bath, Bedford, Bedwin, Beeralston, Bewdley, Bodmin, Bossiny, Boston, Brackley, Bram- ber, Brecon, Bristol, Camelford, Cardiffe, Cardigan, Chip- penham, Clithero, Downton, Gloucestershire, Haslemere, Ha- verford-west, Hereford, Heytesbury, Ilchester, St. Ives, Lei- cester, Leimster, Ludlow, Malton, St. Mawes, St. Michael, Milborne Port, Montgomery, Newport, Northampton, Not- tinghamshire, Poole, Preston, Radnor, Richmond, Southwark, Stamford, Stockbridge, Sudbury, Tavistock, Truro, Wareham, Westminster, and Windsor.-Right of Election for Haslemere, reported, 20 May; for Poole and Wareham, 15 June; for Downton, 3 July; for Stamford and Windsor; for Truro; for Tavistock, 17 Dec. for St. Ives and Preston; for St. Albans, 25 Jan. for Clithero, 4 Feb. for Sudbury; for Ludlow; for Bewdley, 28 Apr.-An Election re- nounced by the Person returned, 16 May, 1661.-Made, pending a Petition concerning a former, to be considered by the Committee, 1 June. Report, and declared void.-Hearing put off, proper Notice not having been given to one of the Parties, 11 Jan.-Election of a Person in Orders declared void, 17 Jan.-not avoided, by Denial of the Poll to a Candidate, being a Prisoner in Execution, 22 Mar.-Hear- ings, where the Parties cannot be ready, to be adjourned, 29 Apr. -, -Bill to prevent Abuses therein, read, 5 June. Committed. Ely, Bishop of, Bill to confirm a Lease made by him to Elizabeth Barker, and others, read, and Message to him thereupon, 15 Feb. His Answer reported. Engagement, Acts for subscribing it, to be burnt, 27 May, 1661; & 9 Apr. 1662. Enyon, Sir James, Bill for Sale of Lands, read, 8 Feb. Committed. Reported, and to be ingrossed, 7 Mar. Passed. Agreed to by the Lords, with Amendments, 3 Apr. Etherick, Anthony, Bill to sell Lands, read, 23 Nov. Committed, 2 Dec. Reported, and to be ingrossed. Passed. Agreed to by the Lords, with Amendments, 14 Jan. Amendments agreed to. Excise, upon Beer and Ale, and other Liquors, to be increased to 400,000£. per Annum, and Lord Treasurer to send Com- missions for inspecting it, 23 July. Committee to consider of Means for improving it, 18 & 28 Jan. Returns, touching the Produce of it, to be made by the Members for the several Counties, 3 Feb. Report, and Committee to receive Propo- sals for advancing it. Question, for a Bill to make it gene- ral on all Beer and Ale, Neg. eod. die. Committee of the whole House to consider of the Advance of it, 21 Feb.-Bill for investing the King with the Arrears of it, not pardoned, read twice, and to be ingrossed, 27 July. Passed, eod. die. -Bill to prevent Frauds therein, read, 15 Mar. Question for Commitment, Neg. and new Bill to regulate it, ordered. Read, 28 Apr. 1662. Committed, 7 May. Exeter, Merchants and Clothiers, their Petitions read, and re- ferred to the Committee for Trade, 22 June, & 6 July. -, -Stuffs, Bill to prevent Abuses in making them, read, 8 Feb. Committed. ELECTIONS, Committee appointed, 18 Feb.
-, -controverted. Vide Boston, Cardigan, Haverford- west, Northampton, and Oxon.-Right of Election for Northampton, reported, 9 Apr. for Boston, 15 May; for Haverford-west. -, -Bill for Redress of Abuses therein, read, 20 Feb.
Enfield Chace, Bill for Relief of the Poor there, read, 12 Mar. Committed. Petition referred, 2 Apr. Error, Writs of, Bill, from the Lords, to prevent Abatements thereof upon Judgments in the Exchequer, 11 Apr. Read, 2 May. Committed. Exchequer, Bill to confirm Two Decrees thereof, read, 2 Apr. Committed. Excise, Committee to inspect the Revenue arising thereby, and several Petitions referred, 4 Apr. Report touching the Value of it, 4 June.-Order for compelling Payment thereof, 14 Apr. Bill, touching the Arrears thereof, presented, 15 May. Read, and debated, and new Bill ordered. Read, 16 June. Committed. Reported, and to be ingrossed, 24 July. Passed.-Bill for regulating it, read, 4 June. Committed, 1 July. Reported, and to be ingrossed. Passed. Conference, desired by the Lords thereon, agreed to, and held, and Report touching several Amendments, made thereto by the Lords, and Proceedings thereon. Free Conference, desired with the Lords thereon, agreed to. Another free Conference, desired by the Lords, agreed to, and their Concurrence reported. Exeter, Petition from thence, complaining of the Violation of the Act of Navigation, read, and Order thereon, 10 July. EAST INDIA Company. Vide Trade. Elections, Committee appointed, 21 Mar. Petitions referred, 5 Apr. 5 & 13 May. -, - controverted. Vide Bedford, and Northampton.-Right of Election for Northampton, reported. -, - Bill for regulating them, read, 19 Apr. Error, Writs of, Bill, from the Lords, to prevent Abatements thereof upon Judgments in the Exchequer, 29 Mar. Read, 1 Apr. Committed. Reported, and passed. Excise, Bill for better collecting it, ordered, 29 Apr. Executions, Bill to prevent Delays therein, read, 5 May. ELECTIONS, Committee appointed, 24 Nov. Petitions referred, 25 Nov. 7 & 23 Feb.
-, - controverted. Vide Bedford, and Berwick. Ely, Isle of. Vide Cambridge. 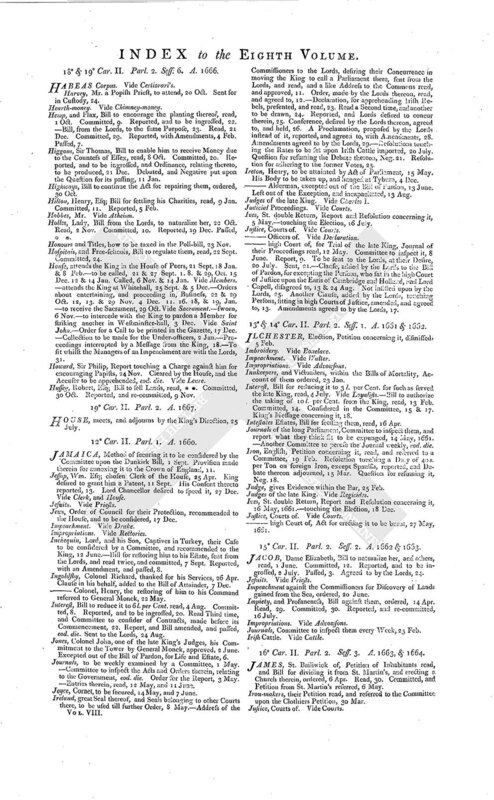 Epworth and Gringley Commons, Bill for settling them, read, 8 Dec. Committed. Equity, Courts of, Bill to regulate Proceedings therein, read, 20 Feb. To be ingrossed. Passed. Essex, County, Sum charged thereon in the Bill of Assessment, 24 Jan.
Estates, Bill to remove Inconveniencies relating thereto, read, 14 Dec. Excise, Bill to explain an Act touching it, read, 21 Feb. Committed. Reported, and to be ingrossed. Passed. Agreed to by the Lords, 1 Mar. ELECTIONS, Committee appointed, 11 Oct.
-, - controverted. Vide Gray, Harwich, and St. Ives, -Hearing of them adjourned till the next Session, 30 & 31 Oct.
Escapes, Bill for Relief of Creditors in Cases thereof, read, 24 Oct. Committed. 18° & 19° Car. II. Parl. 2. A. 1666. ELECTIONS, Committee appointed, 21 Sept. Petitions referred, 24 and 26 Sept. 16 Oct. & 7 Dec.
-, - controverted. Vide Berwick, Bristol, Peterborough, Plympton, Somerset, Weymouth, and Winchelsea. -, - Bill to prevent Abuses therein, ordered, 27 Oct. Read, 17 Jan.
Electors, Bill for qualifying them, read, 17 Jan.
Escapes, Bill for Relief of Creditors in Cases thereof, read, 1 Oct. Committed, 17 Nov.
Estates, personal, how to be taxed in the Poll-bill, 17 Nov. -for Lives, Bill, from the Lords, to prevent Inconveniencies by Want of Proof of the Decease of the Persons, upon whom they depend, 25 Jan. Read, 5 Feb. Committed. Reported, with Amendments. Other Amendments made thereto, and Bill passed. Amendments agreed to by the Lords, eod. die. FAST to be kept by both Houses, and Preachers appointed, 25 Apr.-Committee to prepare a Petition to the King for one, 6 Nov.
Faunt, Geo. Bill to sell Lands, read, 20 Aug. Committed, 15 Nov. Reported, and to be ingrossed, 5 Dec. Passed, 8. Agreed to by the Lords. Fees, in Courts and Offices, Committee to consider of them, and of the Burden upon Sheriffs in passing their Accounts, 25 Aug.
Fens, great Level of, Bill from the Lords, for draining them, 1 Sept. Read. Committed. Petitions referred, 4 Sept. & 19 Nov.-New Bill read twice, and to be ingrossed, 7 Sept. Passed.-Another Bill read, 26 Nov. Committed, and Petitions referred. -, - Bill, from the Lords, for draining Lindsey Level, 8 Dec.
Field, John, sent for in Custody, for printing Bills before the House, 24 Aug. Discharged, 11 Sept. Fisheries, Committee for Trade to consider of them, 8 Nov. Bill for Encouragement thereof, read, 10 Dec. Committed. Reported, and to be ingrossed. Passed. Fitzharris, Sir Edward, sent for in Custody, 22 May. To be examined by a Committee, 1 June. Fleetwoood, Colonel Charles, excepted out of the Bill of Pardon, 18 June. Left out of the Exception, and incapacitated, 13 Aug.
-, - Geo. excepted, 9 June. Surrenders. Inserted in the Clause for suspending Execution, in case of Attainder, 28 Aug. Forth, Mr. offers to advance 500£. for Sir John Greenvile, and Thanks given him thereon, 5 May. Fox, Geo. sent for in Custody for a Riot at Harwich, 21 May. Foxwist, Mr. Committee to consider of his giving Evidence at the Lords, 28 July. Freeman, Colonel, his Petition referred to the Committee of Privileges, 22 May. Fry, John, excepted out of the Bill of Pardon, 9 June. Furlow, Mr. Committee to consider of an Information concerning him, 16 May. Report. 13° & 14° Car. II. Parl. 1. Sess. 1. A. 1661 & 1662. FANATICKS, charged with Designs against the publick Peace, 23 July. Fast, King to be moved to appoint one, and Lords Concurrence therein reported, 31 May. His Answer communicated, 6 June. Persons appointed to preach thereon. Another Fast to be solemnized by the House, and Preachers appointed, 11 Jan.
Fee-farm Rents, Bill to recover Arrears thereof, read, 10 Mar. Fees, in Courts of Justice, & c. Committee to consider of them, 20 June. -, - of the Officers of the Customs, Table thereof to be prepared, 6 Feb. Vide Customs. Fens, called Ancolne Level, Petition of Sir John Munson, and others, concerning them, read, 14 May, 1661. Bill for confirming Decrees relating thereto, read. Committed. Reported, and re-committed, 10 July. Reported, and to be ingrossed, 20 Feb. Passed. -, - Great Level of, Petition of Sir Wm. Platers, and others, relating thereto, and Two Bills concerning it, read, 15 May, 1661. Committed, and several Petitions referred, and Members interested, not to vote at the Committee. Order rectified. Counsel for the Parties interested, to be heard at the Bar, 12 July. Order for Witnesses, 29 Nov. Counsel heard, 2 & 17 Dec. Farther heard, and Bill on behalf of the Earl of Bedford, and others, re-committed, and Counsel for Colonel Sandys and Sir Wm. Terringham to be farther heard, 16 Jan. Heard, 25 Jan. & 1 Feb. Debate, and Resolutions thereon, 5 Feb. Both Bills to be drawn into one. Reported, 9 Apr. 1662. Amendments considered, and Bill re-committed. Reported, 12 May. A temporary Bill tendered, and rejected, eod. die. Amendments farther considered, and Clause, relating to the Judicature to be erected, committed, 13 May. King's Message, recommending a temporary Act. Bill for that Purpose, sent from the Lords.-Bill for continuing an Act for draining it, read, 5 & 12 July. Proviso touching the King's Interest in 10,000 Acres, twice read, and Bill and Proviso committed. Declaration touching the Rights of the Parties interested, eod. die. Bill reported, and to be ingrossed, 16 July. Passed.-Care of the Level recommended to the King, 19 May. -, - Bill for better ordering divers Fens in Lincolnshire, read, 20 June. Committed. Petition of Sir Hen. Heron, and others, relating thereto, read, and referred. Parties to have Notice of the Adjournment of the Committee, and to have Access to Papers, & c. 20 July. -, - Bill, from the Lords, for draining Lindsey Level, 29 June. Read, 3 July. Committed, and Members interested, not to vote at the Committee. Parties to have Notice of their Adjournment, and to have Access to Papers, & c. 20 July. Order, concerning Members interested not voting, explained, 26 Nov. All, except those interested, to have Voices. Chairman to open Papers delivered to him, and Parties to have Copies of them, 5 Dec. Sir Charles Hussey to be heard, by Counsel, at the Bar, 10. 17. & 30, Apr. 1662. Heard, 2 & 10 May. Bill reported. Report to be considered. Care of this Level recommended to the King. -, - Committee to peruse the Act for draining certain Fens, undertaken by Mr. Lovell, and to bring in a Bill for better Performance thereof, 29 Nov.
-, - Bill, from the Lords, for settling Hatfield Level, 5 Dec. Read. Committed, and Petitions referred, 10 Jan. Other Petitions referred, 13 Feb.-Bill for settling Differences between the Participants, to be read, 17 Jan. Read, and laid aside for a time. Cause to be heard at the Bar, 13 May, 1662. -, - Bill, from the Lords, for establishing the Level drained by Sir Anthony Thomas, 5 Dec. Read. Committed, 22 Jan. Transmitted to another Committee, 20 Feb.
Ferrers, Anne, Bill to naturalize her, and others, read, * * Committed, 27 June. Committee revived. Several Persons to be inserted, 16, 17, 18. & 27, Jan. 5, 6, 8. 13, 14. 17. & 25, Feb. & 5 Mar. Bill reported, and re-committed, 7 Feb. Passed, 8 Mar. Fines upon Originals, and Damage-clere, Bill to take them away, read, 29 June. Committed, 6 July. Order for the Report, 7 May. -, -Objection to the Jurisdiction of the House, in the Case of Fines, over-ruled, 13 Jan. Fishing Trade, Bill to confirm Letters Patents concerning it, read, 5 Mar. Committed. Flax, and Hemp, Bill for planting them, read, 22 Apr. Committed. Reported, and re-committed, 29 Apr. & 14 May. Fleet, Warden of, to bring a Prisoner in his Custody to the Bar, 29 June. Fleetwood, George, his Name struck out of the Bill for executing attainted Persons, 21 Jan.
Fowke, Alderman, reprehended on his Knees, for reflecting upon the Proceedings of the House, 13 Mar. Fulham Road. Vide Parsons Green. FAST, King to be moved to appoint one, and Lords desired to concur therein, 6 July. Their Concurrence reported. King's Answer communicated. Fens. Vide Bedford Level, Hatfield Level, Lindsey Level, and Norfolk.-Bill for restoring to the King 8,000 Acres of Fen Lands in Lincolnshire, read, 7 Apr.-Committee to peruse the Act for draining Fens in Lincolnshire, undertaken by Mr. Lovell, and to bring in a Bill to perfect it, 22 June. Fish, Bill to preserve the Spawn thereof, read, 6 Apr. Committed. Fishing Trade, Clause for regulating it, to be added to the Bill for Advancement of Trade, 4 June. Offered, and Bill, to the same Purpose, ordered. Read. Committed. Reported, and to be ingrossed, 2 July. Passed. Agreed to by the Lords, with Amendments, and Amendments agreed to. Fitton, Mr. his Petition tendered, 20 July. Read. Flax, and Hemp, Bill for sowing them, ordered, 28 Feb. Read, 27 Mar. Fleet, Bill to enlarge the Power of the Law martial therein, read, 10 Mar. Committed. Reported, and Negative put upon the Question for Ingrossment. -, -Prison, Warden thereof, to attend about repairing Westminster-hall, 31 Mar. To produce his Title to the Shops here, 7 Apr. FALMOUTH Church, Bill, from the Lords, to make it parochial, 6 May. Read. Committed. Reported, with Amendments. Passed. Conference, desired by the Lords thereon, held, and Amendment, made by the Lords to one of the Amendments, reported, and agreed to. Felt-makers, Bill concerning them, read, 21 Apr. Committed. Fleet, Warden of, to bring a Prisoner in his Custody to a Committee, 21 Apr. FAST, King to be moved to appoint one, and Lords to be desired to concur therein, 28 Feb. Conference held for that Purpose, and their Concurrence reported, and Committee of both Houses to attend the King thereon, 1 Mar. His Answer reported. Fees, in Courts, Bill to regulate them, read, 13 Dec. Committed.-Committee to examine the Amount of the Fees at the Exchequer, upon paying and issuing the Supply, 18 Jan. Felons de se, Bill concerning them to be read, 6 Feb.
Felt-makers, Bill concerning them, read, 5 Dec. Fishing, Bill to prevent Abuses therein, read, 25 Nov. Committed. Fugitives, Committee to inspect the Laws concerning them, 19 Oct.
FANCE, Bonham, Esq; Bill to make good a Recovery, suffered by him, read, 12 Oct. Committed. Reported, and to be ingrossed. Fane, Sir Vere. Vide Peterborough. Fine, set by the House upon a Person ordered into Custody, and absconding, 6 Feb.
Fire, Bill for providing Utensils for quenching it, ordered, 10 Nov. Read. Committed, 3 Dec.
-, -Bill to preserve the Fry and Spawn thereof, read, 5 Oct. Committed. Fitzwilliams, Lord, his Petition referred to the Committee of Elections, 26 Sept.
Footmen, Order against their being in the Lobby, or on the Stairs, 13 Oct.
Fountaine, Serjeant, to be heard at the Committee upon the Bedford Level Bill, 22 Jan.
Frampton, Mr. desired to preach, 24 Sept. Thanked, & c. 11 Oct.
France, Bill to prohibit the Importation and Use of the Manufactures thereof, ordered, 8 Oct. Read, 17 Jan. Committed. Reported, and Amendments to be considered, 1 Feb.- Address for a Proclamation against the Importation of French Manufactures, resolved, and Lords desired to concur therein, 8 Oct. Conference, desired by the Lords thereon, held, and reported. Their Answer to be considered. Debated, and Committee to prepare Reasons in Reply. Reasons reported, and Conference desired with the Lords thereon, agreed to, eod. die. Another Conference, desired by the Lord, held, and Address returned, with an Amendment. Amendment agreed to, and Committee of both Houses to attend the King with the Address, eod. die. His Answer reported, 2 Nov.-Petition of Merchant Adventurers in the Trade of France, read, and Questions thereon, Neg. 12 Jan. -of divers Merchants, trading to France, read, and referred to a Committee. Report, and Resolutions thereon, and Lords to be desired to concur therein 22. Resolutions agreed to by the Lords, and to be presented to the King. Committee of both Houses to attend him therewith. Franks, counterfeit, complained of, 6 Feb.
Frazer, Dame Mary, Bill to naturalize her, and others, read, 2 Nov. Committed. Reported, and to be ingrossed, 15 Dec. Passed. Agreed to by the Lords, with Amendments, 24 Jan. Amendments agreed to. Fuelling, Committee to examine the Abuses in advancing the Price thereof, 5 Jan. Report, and Address for a Convoy for Coal-ships resolved. GARDNER, Maurice, his Petition read, and Order for charging 100£. allowed to him, upon the Excise, 29 Dec.
Gargrave, Dame Cath. Bill for avoiding a Lease wrested from her by Sir John Danvers, read, 11 Aug. Committed. Garland, Augustine, excepted out of the Bill of Pardon, as to Pains and Penalties, 9 June. Surrenders. Inserted in the Clause for suspending Execution, in case of Attainder, 28 Aug.
Gerrard, Wm. his Examination, touching Colonel White, reported, and Order for his Discharge, 15 June. Gatton Election, Report concerning it, and adjudged void, 5 May. Gauden, Dr. desired to preach, 25 Apr. Thanked, & c. 1 May. Gerrard, Lord, Bill, from the Lords, to restore him to his Estates, 27 Aug. Read. Committed. Reported, with Amendments, and passed, 5 Sept.
Gilbert, Eliz. her Petition read, and referred to the Commissioners for Church Lands, 16 Nov.
Gloucester, Duke of, Order for presenting him with 5,000£. 10 May. Money charged upon the Three Months Assessment. Order touching the Repayment of it to the Person advancing it, 17 May, & 8 June. His Letter of Thanks read, and to be entered in the Journal, 7 June. Order for charging 7,000£. for him upon the Excise, 1 Sept. Agreed to by the Lords. Resolution touching the disbanding of his Regiment. Returns the House Thanks by the Speaker. Goffe, Wm. excepted out of the Bill of Pardon, as to Pains and Penalties, 9 June. Excepted for Life, 9 July. Goods, seized without Authority, Complaint, and Orders thereupon, 21 May. Goodwin, John, King to be oved form a Proclamation to call in his Book in Defence of the Sentence against the late King, and Attorney-general to prosecute him, 16 June. Sent for in Custody, eod. die. Excepted out of the Bill of Pardon, 18 June. Left out of the Exception, and incapacitated, 13 Aug.
Gostwick, Sir Edward, Bill to provide for his younger Children, read, 23 July. Committed, 20 Nov. Reported, and to be ingrossed, 4 Dec. Passed. Agreed to by the Lords. Government. Vide Kingdom.-Persons, accused of reviling it, sent for in Custody, 21 May. Grantham Election, and double Return, Report and Resolution, relating thereto, 18 May. Grants of Honours and Offices. Vide Offices. Gray, Angell, his Petition referred to the Committee upon the Bill of Pardon, 23 May. Proviso, concerning him, read, and rejected, 7 July. Greenville, Sir John, delivers the King's Letter and Declaration to the House, 1 May. To receive the Thanks of the House, and to be presented with 500£. 2. Called in, and thanked accordingly. Order for charging the Money for him upon the Excise. Greenwich House, to be restored to the Queen, 23 June. Greg, Wm. Committed to the Serjeant, for intruding into the House, 1 Aug.
Gressingham, Robert, sent for in Custody, for a Riot at Harwich, 21 May. Grey, of Grooby, Lord, not to be excepted out of the Bill of Pardon, as to his own Estate, 9 June. Several Certificates in his Behalf, read, 11 Aug. His Name left out of the Bill. Grimston, Sir Harbottle, chosen Speaker, 25 Apr. Vide Speaker. Guarum, Robert, Receiver for Cornwall, his Case referred to the Committee for the Army, 20 Aug.
13° & 14° Car. II. Parl. 2. Sess. 1. A. 1661. & 1662. GAMING, Bill to restrain it, read, 13 Jan.
Gardiner, Mrs. her Petition, concerning a Debt due to her Husband, read, 8 July. Case recommended to the King, 11 July, 1661; and 19 May, 1662. Gipps, Richard, Bill for Sale of his Lands, read, 22 June. Committed. Reported, and to be ingrossed, 3 July. Passed. Glass Bottle Patent, Bill for confirming it to be read, 26 Feb.
Gloucester, County, Election, Report and Resolution concerning it, 19 Apr. Gold Lace, and Wire. Vide Lace, and Wire. Goldsmiths Wares, Bill relating thereto read, 28 Feb. Committed, 11 Mar. Government, Instrument of, Search to be made for it in the Courts of Justice, 14 May, 1661. To be burnt. Greenfield, Mr. desired to preach, 7 June. Gregory, John, to be examined, touching a Letter signed by him, and Serjeant to bring him from Newgate in Custody, 19 Feb.
Grey, Angel, Bill for Satisfaction of a Debt due to him from Sir John Danvers, read, 12 July. Committed. Grievances, Grand Committee appointed, 11 May, 1661. Impowered to send for Witnesses, & c. 27. Report touching a Complaint against the Serjeant, and Order thereon, 6 June. -touching the Ballast Patent, 15 June. Vide Ballast. Guest, John, Bill for disposing of his Charities, read, 16 Jan.
Gunning, Dr. desired to preach, 13 May, 1661. Thanked. GAMING, Bill against it, brought from the Lords, and read, 24 July. Committed. Gardner, Mr. Order about him renewed, 27 July. George, John, Complaint of his personating Mr. George, the Member, and Committee to examine it, and Message to the Lord Treasurer thereon, 21 Mar. Goldsmiths Wares, Bill concerning them, read, 20 Feb. Committed. Green, Tho. sent for in Custody, about a Paper delivered at the Door, 7 Mar. Grievances, Grand Committee appointed, 18 Feb.
Grocers of London, Bill for incorporating them to be Governors of Whitney Free-school, read, 28 Feb. Committed, 5 Mar. Reported, and to be ingrossed. Passed, 19 May. Agreed to by the Lords, with Amendments, and Amendments agreed to, 2 July. Guest, John, Bill for settling his Charities, read, 6 Mar. Committed. Reported, and to be ingrossed. Passed, 3 Apr. Agreed to by the Lords, 12 May. 16° Car. II. Parl. 2. Sess 3. A. 1663 & 1664. GAMING, Bill, from the Lords, against it, 4 May. Read. Committed. Reported, with Amendments, and passed. Glenham, Sir Sackvile, Bill for Sale of Lands, for Payment of his Debts, read, 23 Mar. Committed. Reported, and to be ingrossed, 4 May. Passed. Grievances, Grand Committee appointed, 21 Mar. GLOUCESTER, County, and City, Medium of the Rates, to be charged thereon in the Bill of Assessment, to be prepared, 16 Dec. Sums inserted, 24 Jan.
Grey, Thomas, Esq; his Petition referred to the Committee of Elections, 7 Feb. Grievances, Grand Committee appointed, 24 Nov.
GAME, Bill to preserve it, read, 13 Oct. Committed. Reported, and re-committed. Gray, Thomas, Esq; his Petition referred to the Committee of Elections, 20 Oct.
Graziers, of Wilts and Berkshire, their Petition read, and adjourned to the next Session, 31 Oct. Grievances, Grand Committee appointed, 11 Oct.
GENTLEMEN, how taxed in the Poll-bill, 23 Nov.
Godolphin, Sir Wm. his Petition read, and referred to the Committee of Elections, 1 Oct.
Goring House, Bill for Sale of it, read, 3 Nov. Committed. Petition referred, 12 Dec.
Gray, Mr. Committee of Elections ordered to receive his Petition, 4 Oct. Grievances, Grand Committee appointed, 21 Sept. Mr. Tayleur's Petition referred, 2 Nov. Report touching the Loss of it, and another presented, and referred. Orders concerning the sitting of the Committee. Report, and Resolutions, touching Mr. Tayleur's Complaint against Lord Mordant, and an Impeachment against him ordered, 18 Dec. Vide Mordant. Grosvenor, Leicester, Bill, from the Lords, to sell Lands, 10 Jan. Read. Committed. Reported, and passed. HABERDASHERS Company, Bill for incorporating them to be Governors of Mr. Adams's Free-school at Newport, read, 4 Aug. Committed. Reported, and to be ingrossed. Passed. Haberthwaite, Mr. complained of, for obstructing the Officers of Excise, 8 Sept.
Hacker, Francis, Amendment, relating to him, made by the Lords to the Bill of Pardon, agreed to, 13 Aug.
Hackney Coachmen, their Petition, and Bill to incorporate them, read, 21 Nov.
Hales, Sir Edward. Vide Debts. Hamilton, Sir Geo. Bill, from the Lords, for restoring him to Lands in Ireland, 5 Dec. Read. Passed. Hamond, Thomas, excepted out of the Bill of Pardon, 9 June. Harley, Colonel, Governor of Dunkirk, his Petition to the Council, read, 29 June. Harrington, Sir James, excepted out of the Bill of Pardon, 9 June. His Petition referred to the Committee upon the Bill of Attainder, 17 Nov. His Letter to the Speaker, and Petition inclosed, delivered in, 29 Dec.
Harrison, Colonel Thomas, to be sent up in Custody, 11 May. Order concerning his Horses seized. To be kept close Prisoner in the Tower. excepted, for Life and Estate, out of the Bill of Pardon, 5 June. Leave to the Minister of St. Faith's to visit him, 9 July. Harvey, Colonel Edmund, excepted out of the Bill of Pardon, 9 June. Surrenders. Inserted in the Clause for suspending Execution, in case of Attainder, 28 Aug.
Harwich, Bill for maintaining a Minister there, read, 14 July. Committed. Committee to send for Witnesses, & c.- Petition from Harwich, touching a Debt for sick and wounded Soldiers and Seamen, read, and referred to a Committee, 14 Dec. Vide Sea-ports. Haverford-west Election, Report concerning it, and declared void, and new Writ ordered, 29 June. Helston, double Return, Report and Resolution concerning it, 5 May. Further Report, and Election declared void, and new Writ ordered, 27 June. The other Election to be examined by the Committee, 3 Aug. Report and Resolution touching the Returns.-touching the Election, and Report re-committed, 7 Nov. Further Report, and Resolution of Committee disagreed to, 10 Dec.
Henrietta, Princess, Order for presenting her with 10,000£. 6 Nov. Agreed to by the Lords. Congratulatory Message to her on her Arrival. Her Answer reported. Hertford, Marquis of. Vide Somerset, Dukedom. Hesilrig, Sir Arthur, excepted out of the Bill of Pardon, as to Pains and Penalties, 13 June. Amendment, made thereto by the Lords, for excepting him for Life, disagreed to, 13 & 24 Aug. Not insisted on by the Lords. Haveningham, Wm. Esq; Security to be taken for the safe keeping of his Goods, 22 May. Surrenders, and excepted out of the Bill of Pardon, as to Pains and Penalties, 9 June. Question for reading his Petition, Neg. 25 Aug. Inserted in the Clause for suspending Execution, in case of Attainder. Hewlett, Wm. excepted out of the Bill of Pardon, 18 June. His Letters to the Speaker, and Petitions inclosed, delivered in, 29 Dec.
Hewytt, Dame Mary, her Petition read, 15 May. Hide, Francis, Bill to naturalize him, and others, passed, 15 Dec. Vide Oudart. Higham-ferrers Election, Report and Resolution concerning it, 16 May. Highways, Bill for repairing them read, 14 Nov. Committed, * *. Instruction. Order for the Report, 1 Dec.
Hills, Henry, taken into Custody, for printing Bills before the House, 24 Aug. Released, 11 Sept.
Hilton, Henry, Esq; Bill for incorporating the Lord Mayor, and Four Aldermen, to execute his Will, to be read, 11 Dec.
Hindon, double Return, Report and Resolution concerning it, 3 May.-touching the Election. Hodder, John, Commissary of Provisions in Ireland, his Petition read, and referred to the Committee for publick Debts, 17 Dec.
Holland, Cornelius, to attend about the Crown Jewels, 15 May. Matter, communicated to the House, relating to him, referred to a Committee. Report. Excepted out of the Bill of Pardon, for Life and Estate, 6 June. -, - John, Committee to receive, and consider of, a Propo- sition to be offered by him, 27 Nov.
Holles, Denzel, Esq; one of the Messengers appointed to carry the Answer to the King's Letter, 7 May. Complains of an Aspersion cast upon him about his Speech to the King, and to vindicate himself by printing it, 2 June. Honywood, Sir Robert, Order for Payment of Money upon Bills drawn by him, and other Commissioners, in Sweden, 12 Dec. Agreed to by the Lords. Horton, Thomas, excepted out of the Bill of Pardon, 9 June. House, goes to St. Margaret's to hear a Sermon, and afterwards meets, 25 Apr. Orders about their receiving, and proceeding in, private Business, 25 Apr. 23 & 31 Aug. 8 Sept. & 26 Nov. Orders Sermons to be preached before them, 25 & 26 Apr. & 11 June. Resolution touching the Heads of their Answer to the King's Letter, and Committee to prepare it, 1 May. -to be printed, eod. die. Answer reported, and agreed to, with Amendments, 2 May. To be kept by the Clerk, and no Copies to be made of it. Members to carry it, to be chosen by Ballot, and Committee appointed to inspect the Lists, eod. die. House told, and Ballot taken, 5 May. Reported. Committee appointed, to meet with a Committee of Lords, to prepare Instructions for the Messengers. Instructions reported, and agreed to, and sent to the Lords, for their Concurrence. Order touching the Return of the Messengers eod. die. Instructions returned from the Lords, with Amendments, and agreed to, eod. die. Answer and Instructions, delivered to one of the Messengers, 11 May. To be printed.-Books and Records, belonging to the House, to be delivered to the Clerk.-House to attend the Proclamation of the King, and Order touching the Procession.-Question for locking the Door, Neg. 15.-Letter from the Messengers, sent to the King, read.-A Guard to attend the House in their Passage to Whitehall, upon the King's Entry. Form of the Procession, and Manner of their Reception.-House attends the King in the House of Peers, 1 June; 28 July; 18 & 29 Aug. 13 Sept. & 29 Dec.-sworn by the Lord Steward, and his Deputies, 4 June. Vide Oaths. -to attend the King, with their Declaration about laying hold of the Pardon.-accepts an Invitation to dine with the City.-Proceedings not to be printed without Leave. Vide Privileges.-Guard, attending the House, to be withdrawn, 12 July.-Salvo, for asserting their sole Right of naming Commissioners in Bills, that charge the People, to be drawn, and entered in the Journal, 15 Aug.-Orders for their sitting in the Afternoon, 1 Sept. 10. 13. 15. 17. 20. & 27, Dec.-touching the Time of their meeting in a Morning, 1 Sept. & 18 Dec.-Committee to consider of Allowances to the Officers, 5 Sept. Instruction touching the Printers, and Stationer. Report, and Orders thereon, 11. Further Orders. Another Committee appointed for the same Purpose, 18 Dec. Report, and Orders thereon.- House to be called, 6 & 12 Nov.-to attend the King with Thanks for his Declaration concerning ecclesiastical Affairs.-Committee to make Enquiry concerning the Form of Prayer, formerly used in the House. Howard, Sir Robert, Bill to confirm a Sale of Lands by him, read, 31 July. Committed, 7 Aug.
Hughson, John, excepted out of the Bill of Pardon, as to Pains, and Penalties, 9 June. Excepted for Life, 9 July. Hutchinson, Colonel John, his Letter to the Speaker, read, and to have Liberty on his Parole, 5 June. Expelled, and incapacitated, but not to be within the Exception in the Bill of Pardon. Proviso offered thereto, concerning Money received by him from Sir John Digby, read twice, and committed, 7 July. Reported, and re-committed. Agreed to.-Bill, from the Lords, for settling Lands, belonging to him, upon Lord Lexington, and Sir Thomas Williamson, 22 Nov. Read, 11 Dec. His Petition read, and Question for reading the Bill a Second time, Neg. eod. die. HACKNEY Coaches, Bill to regulate them, read, 17 Dec. Committed. Reported, and re-committed, 1 Feb. To be incorporated into the Bill for repairing the Streets. Hamilton, Sir Geo. Vide Acts. Harbin, John, Esq; Bill to sell Lands, read, 16 May. Committed. Reported, and to be ingrossed. Passed, 11 June. Hardy, Dr. desired to preach, 23 Jan. Thanked, & c. 31. -, - Sir James, to be apprehended, 29 June. To be included in the Bill of Pains and Penalties, 1 July. Harwich Harbour, Bill for repairing it, read, and withdrawn, 5 Apr. Haslemere, double Return, Report and Resolution concerning it, 17 May, 1661.-touching the Election, and Bailiff sent for in Custody. Reprimanded and discharged. Haslerig, Sir Arthur, Evidence against him to be prepared, 1 July. To be produced at the Bar. Produced accordingly, and Resolutions thereon, declaring him guilty of high Treason, and for the Forfeiture of his Estate. His Name to be inserted into the Bill of Pains and Penalties, and King to be petitioned to restore his Estate, eod. die. Petition reported, 16 July. Sent to the Lords. Haverford-west Election, Report concerning it, re-committed, 4 Apr. Hereford, double Return, Report and Resolution concerning it, 16 May, 1661. Further Report, and Election declared void, 23 July. Hertford, Marquis of, Bill to confirm the Act for restoring him to the Dukedom of Somerset, read, 25 Nov. Committed. Reported, and Copy of the Act to be brought in, 3 Dec. Debate resumed, and Bill to be ingrossed. Passed. Agreed to by the Lords. Hessen, Charlotte and Catherine, Bill, from the Lords, to naturalize them, and their Children, 8 Apr. Read First time, * *. Read a Second time, and ordered a third Reading, 14 Apr. Hewley, Mr. his Petition to be read, 19 Dec.
Heytesbury, double Return, Report concerning it, and declared void, 17 May, 1661. High-commission Court, Committee to peruse the Act for taking it away, 25 June. Bill to explain a Clause therein, read. Committed, 5 July. Reported, and re-committed. To be ingrossed eod. die. Passed, 13 July. Agreed to by the Lords, with Amendments, and Amendments agreed to. Highways, Bill for enlarging and repairing them, read, 24 May, 1661. Committed. Reported, 9 Jan. Amendments considered. Farther Proceedings thereon, 7 & 8 Feb Consideration of them resumed, and Resolutions touching the Number of Cattle to be used in drawing Carriages, and the Weight to be carried therein, and Bill re-committed, 5 Apr. 1662. Reported, and Committee to peruse and settle the Amendments. To be new-written, and farther amended. Several new Amendments reported, and Bill re-committed. Reported, and to be ingrossed. Read the Third time, and to be rectified according to a Vote then passed. Several other Amendments reported, and a Proviso added, and Bill passed, and to be perused by the former Committee. Amendments, made thereto by the Lords, considered, and some disagreed to, and Conference, desired with the Lords thereon, agreed to, 17 May. Free Conference, desired by the Lords, held, and reported, and Proceedings thereon, and Reason, for disagreeing to Two Provisoes, added by the Lords, to be insisted upon at a Conference. Report touching their adhering to one of their Amendments, and receding from the rest, and Amendment, insisted upon by the Lords, agreed to, eod. die.-Bill, from the Lords, for repairing the Highways in and near Westminister, read, and laid aside, and another, for the like Purposes, to be drawn, 24 July, 1661. Vide London and Westminister. Hilton, Henry, Esq; Bill for settling the charitable Uses of his Will, read, 13 Mar. Committed. Hitcham, Sir Robert, Bill for settling Lands devised by him to charitable Uses, read, 31 May, 1661. Committed, 19 June. Reported, and to be ingrossed, 10 Apr. 1662. Passed. Holland, Parish of, in Lancashire, Bill for New-erection of it, and endowing the Rectory, read, 17 June. Houlford, John, Bill to sell Lands, read, 5 June. Committed. House, attends the King in the House of Peers, 8 & 10 May; 8 & 30 July; 20 Nov. & 20 Dec. 1661; & 19 May, 1662. -to be called, 11 & 16 May, 1661.-to receive the Sacrament. Vide Sacrament.-to attend the King at Whitehall, 13 May, & 28 Feb. 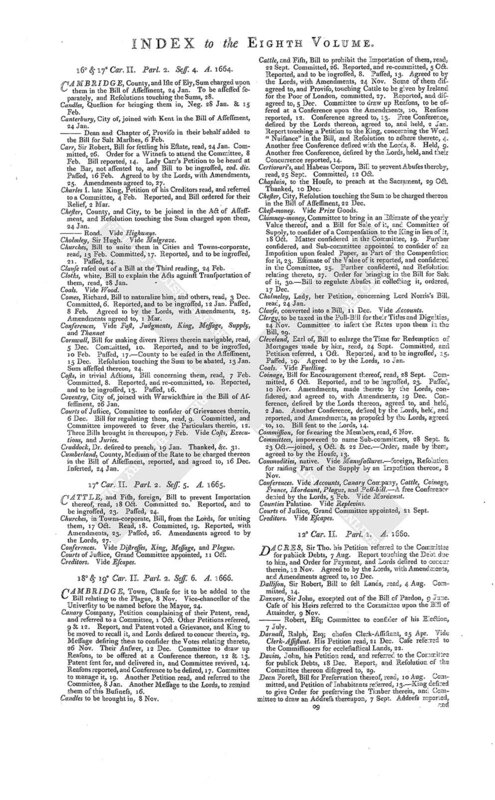 Meets, and adjourns for that Purpose, 13 May, & 1 Mar.-Proceedings not to be printed without Order, 14 May.-House called.-to attend the Speaker to Church.-Orders touching the Times of their proceeding upon Business, 10 June; 28 Jan. & 1 Mar.-Certain Votes and Proceedings to be printed, 15 July, 1661; & 13 May, 1662.-To meet, for executing a Commission for taking the Subscriptions of the Members for a Present to the King, 15 July, 1661.-Petition of the Officers read, and Message to the Lord Treasurer thereon, and Committee to consider of a Recompence to them, for their Attendance.-Surveyor-general desired to open a Passage to the House, and make convenient Offices for keeping the Records, eod. die.-House adjourns upon a Question till the Afternoon, eod. die.-adjourned by the King's Direction, 30 July.-Another Call ordered, 19 Dec. But off, 9 Jan.-Objection to the Jurisdiction of the House in the Case of Fines, over-ruled.-House adjourns, without doing Business.-Refuses to give their Reasons to the Lords for a Proceeding upon a Bill, 1 Feb.-Question for sitting at certain Times desired by them, Neg. 24 Mar.-Other Orders for calling the House, 21 Apr. & 5 May, 1662.-Goes to the House of Peers, upon the Passing of Bills by Commission, 2 May.-Another Petition of the Officers read, and Collection to be made for them, 16. Howard, Sir Robert, Bill to confirm Conveyances made by him, read, 24 May. Committed, 1 June. Reported, and Question for ingrossing it, Neg. 26 Feb.
-, -Philip, Esq. Vide Quarrel. Hull, Bill for dividing Trinity Church there from Hasle, read, 17 June. Committed. Reported, and to be ingrossed, 17 July. Passed. Agreed to by the Lords, 17 Dec.
Humiliation, Day of. Vide Fast. Hunt, Thomas and John, their Petition read, and Bill to enable them to sell Lands, ordered, 20 May. Read. Committed. Reported, and to be ingrossed, 14 June. Passed. Huntingdon, Earl of, Bill, from the Lords, to confirm a Sale of Lands, 21 Feb. Read, 4 Mar. Committed. Reported. Passed. Hussey, Sir Charles. Vide Fens. Hutchinson Colonel, Bill for raising Money out of his Estate, read, 8 June. Committed. Reported, and to be ingrossed, 3 Feb. Question for its passing, Neg. 22. HABERDASHERS, of London, their Claim of selling Wines by Retail, to be considered by the Committee for the Revenue, 8 Apr. Clause, on their behalf, tendered to the Bill for Wine Licences, and rejected, 6 July. Hackney, Coachmen, their Petition read, and referred to a Committee, 13 Mar. Report, and Resolutions touching the Exactions of the Officers, and Order for prosecuting them. Another Petition read, and referred to the Commissioners, 27 July. Hatfield Level, Bill for settling Lands therein, drained by Sir Cornelius Vermuydem, read, 26 Feb. Committed, 9 Mar. Parties to be heard at the Bar, 13 Apr. Heard, and Resolutions thereon, and Bill referred back to the Committee, 5 May. Committee to receive all Petitions offered. Haverford-west Election, Report concerning it, and Resolution of the Committee disagreed to, and new Writ ordered, 23 May. Hearths, and Chimneys, Committee to peruse the Act for raising a Revenue thereby, 6 Apr. To consider of the Improvement of it, 9 May. Orders for bringing in, and inspecting, the Returns, 21 & 26 May, & 2 June. Report of the Value of it, 4 June.-Bill for better collecting it, read, 15 July. Question for Commitment, Neg. 17.-New Bill read twice, and committed. Reported, and to be ingrossed. Passed. Agreed to by the Lords, with Amendments. Amendments agreed to. Herring Fishery. Vide Fishing Trade. Hertfordshire Roads. Vide infra Highways. Highways. Vide London, and Watling-street-Committee to peruse the Act for them, 23 Feb.-Petition for a Bill to repair Standon Highway, in Hertfordshire, read, and Bill ordered, 21 Mar. Another Petition, for a Bill to repair several Highways in Cambridgeshire, read, and Bill ordered eod. die. Bill read, 28 Mar. Committed. Reported and to be ingrossed, 14 Apr. Passed, 6 May. Agreed to by the Lords, with Amendments, 20 May. Amendments agreed to. House, attends the King in the House of Peers, 18 Feb. & 27 July.-to be called, 21 Feb. 14 Apr. 4. 18. & 25, May; & 1 June.-attends the King at Whitehall, 28 Feb. 31 Mar. & 12 June.-called, 5 Mar. 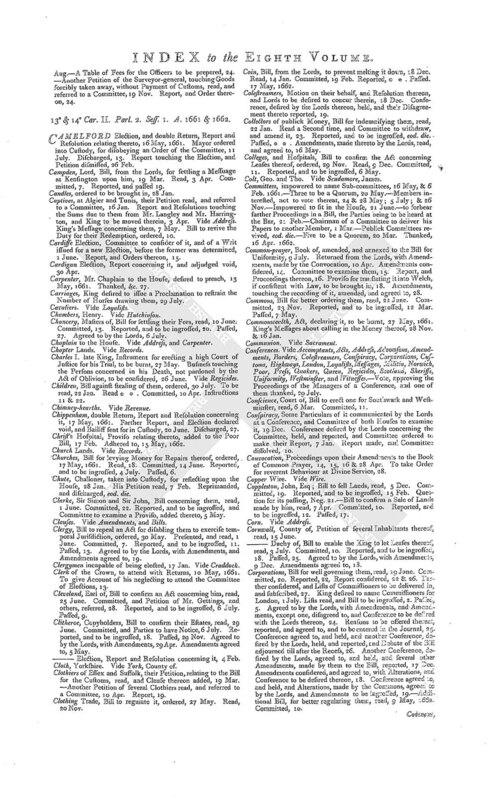 & 4 May.-Complaint of Strangers being admitted, and Back-door to be kept locked, 5 Mar.-Order for an Adjournment, 14 Apr.-House to solemnize the Anniversary of the King's Restoration, at St. Margaret's Church, and Preacher appointed, 14 May.-goes to the House of Peers, upon the passing of Bills by Commission, 3 June.-Proceedings not to be printed without Leave.-Collection to be made for the Officers.-To solemnize the Fast at St. Margaret's, and Preachers appointed, 18 July. Howard, Sir Robert, Bill to confirm a Sale of Lands, read, 14 May. Committed. Reported, and to be ingrossed, 30 June. Passed, 3 July. HACKNEY, Manor, Bill for settling it, for Payment of the Earl of Cleveland's Debts, read, 2 Apr. Hackney Coaches. Vide infra Highways. Hallage upon Cloth, Increase of it voted an Obstruction to Trade, and Bill to reduce it, ordered, 3 May. Read. Hearth-money, Bill for better collecting it, ordered, 30 Mar. Acts relating thereto, and Bill for better collecting it, read, 1 Apr. Committed. Considered in the Committee. Reported, and to be ingrossed. Passed. Agreed to by the Lords, with Amendments, 6 May. Amendments agreed to. Highways, and Streets, Bill to repair them, and regulate Hackney Coaches, read, 29 Apr. Question for committing it, Neg. 7 May. House, adjourns, upon a Message from the King, 16 Mar. Attends the King in the House of Peers, 21 Mar. 5 Apr. & 17 May.-to be called, 21 Mar.-called.-attends the King at Whitehall, 27 Apr.-Collection to be made for the Officers, 12 May. Hyde-park Water, Bill concerning it, read, 30 Mar. Committed, and Petition of Mr. Davyes referred, 2 Apr. Counsel to be heard for the King, 10 May. Hallage Duty, Bill to regulate it, read, 3 Dec. Committed. Reported, and Debate thereon adjourned, 25 Feb.
Hallifax, Corporation, Bill to confirm Letters Patents thereto, read, 5 Dec.
Hartlepoole Pier, Petition for a Bill to repair it, and Bill ordered, 7 Feb. Read. Question for committing it, Neg. 15. Hemp, and Flax, Bill to encourage the planting of them, read, 14 Dec.
Hereford, County, to be eased in the Assessment, 15 Dec. Resolution touching the Sum to be abated, 13 Jan. Sum assessed thereon. Hertfordshire Roads, Bill to continue the Act for repairing them, read, 23 Jan. Committed. Reported, and to be ingrossed, 1 Feb. Passed. Agreed to by the Lords, with Amendments. Amendments agreed to.-Sum charged upon the County in the Bill of Assessment, 24 Jan.
Higgons, Sir Thomas, his Petition read, and Bill ordered for his Relief, 14 Feb. Highways, Committee to peruse the Laws relating thereto, and bring in a Bill for repairing them, 26 Nov. Instruction concerning the Road from London to Chester, 5 Dec. Resolutions relating thereto reported, and agreed to, and Bill ordered thereon, 17 Jan. Road, 1 Feb. Committed.-Bill for repairing the Highways in the Counties of Bedford, Bucks, Northampton, and Warwick, to be read, 1 Dec. Rejected.-Bill for repairing Highways in Hertfordshire, read, 23 Jan. Vide antea Hertfordshire.-Bill, from the Lords, for repairing Highways in and near London and Westminster, 13 Feb. Vide London. House, attends the King in the House of Peers, 24 Nov. 9 Feb. & 2 Mar.-to solemnize the 30th of January at St. Margaret's, and Preachers appointed, 19 Jan. Hull, joined with York in the Assessment, 15 Dec.
Hungerford, Sir Edward, Bill to sell Lands, read, 1 Dec. Committed. Reported, and to be ingrossed. Passed. Agreed to by the Lords, 21 Jan.
Hunston, Thomas, Bill to sell Lands, read, 6 Dec. Committed. Huntingdon, County, Sum charged thereon in the Bill of Assessment, 24 Jan.
HARWICH, Election, Hearing adjourned till the next Session, 30 Oct. Heirs and Executors, Bill for speedy Recovery of their Rights, read, 13 Oct. Committed.-New Bill read. Committed. Hemp, and Flax, Bill to encourage the planting thereof, read, 13 Oct. Committed. Reported, and to be ingrossed, * *. Passed. House, attends the King at Christ-church, 10. 12. & 31, Oct.
Harvey, Mr. a Popish Priest, to attend, 20 Oct. Sent for in Custody. Hemp, and Flax, Bill to encourage the planting thereof, read, 1 Oct. Committed. Reported, and to be ingrossed.-Bill, from the Lords, to the same Purpose. Read, 21 Dec. Committed. Reported, with Amendments, 4 Feb. Passed. Higgons, Sir Thomas, Bill to enable him to receive Money due to the Countess of Essex, read, 8 Oct. Committed. Reported, and to be ingrossed, and Ordinance, relating thereto, to be produced, 21 Dec. Debated, and Negative put upon the Question for its passing, 11 Jan. Highways, Bill to continue the Act for repairing them, ordered, 30 Oct.
Hilton, Henry, Esq; Bill for settling his Charities, read, 9 Jan. Committed. Reported, 5 Feb.
Holles, Lady, Bill from the Lords, to naturalize her, 22 Oct. Read, 2 Nov. Committed. Reported, 19 Dec. Passed, * *. Honours and Titles, how to be taxed in the Poll-bill, 23 Nov. Hospitals, and Free-schools, Bill to regulate them, read, 22 Sept. Committed. House, attends the King in the House of Peers, 21 Sept. 18 Jan. & 8 Feb.-to be called, 21 & 27 Sept. 1. 8. & 29, Oct. 15 Dec. 12 & 14 Jan. Called, 6 Nov. & 14 Jan. Vide Members. -attends the King at Whitehall, 25 Sept. & 5 Dec.-Orders about entertaining, and proceeding in, Business, 22 & 29 Oct. 12, 13. & 29 Nov. 4 Dec. 11. 16. 18, & 19, Jan. -to receive the Sacrament, 29 Oct. Vide Sacrament.-sworn, 6 Nov.-to intercede with the King to pardon a Member for striking another in Westminster-hall, 3 Dec. Vide Saint John.-Order for a Call to be printed in the Gazette, 17 Dec. -Collection to be made for the Under-officers, 2 Jan.-Proceedings interrupted by a Message from the King.-To fit whilst the Managers of an Impeachment are with the Lords. Howard, Sir Philip, Report touching a Charge against him for encouraging Papists, 24 Nov. Cleared by the House, and the Accuser to be apprehended, eod. die. Vide Leure. Hussey, Robert, Esq; Bill to sell Lands, read, * *. Committed, 30 Oct. Reported, and re-committed, 9 Nov.
19° Car. II. Parl. 2. A. 1667. HOUSE, meets, and adjourns by the King's Direction, 25 July. JAMAICA, Method of securing it to be considered by the Committee upon the Dunkirk Bill, 1 Sept. Provision made therein for annexing it to the Crown of England. Jessop, Wm. Esq; chosen Clerk of the House, 25 Apr. King desired to grant him a Patent, 11 Sept. His Consent thereto reported. Lord Chancellor desired to speed it, 27 Dec. Vide Clerk, and House. Jews, Order of Council for their Protection, recommended to the House, and to be considered, 17 Dec.
Inchequin, Lord, and his Son, Captives in Turkey, their Case to be considered by a Committee, and recommended to the King, 12 June.-Bill for restoring him to his Estate, sent from the Lords, and read twice, and committed, 7 Sept. Reported, with an Amendment, and passed. Ingoldsby, Colonel Richard, thanked for his Services, 26 Apr. Clause in his behalf, added to the Bill of Attainder, 7 Dec.
-, -Colonel, Henry, the restoring of him to his Command referred to General Monck, 22 May. Interest, Bill to reduce it to 6£. per Cent. read, 4 Aug. Committed. Reported, and to be ingrossed. Read Third time, and Committee to consider of Contracts, made before its Commencement. Report, and Bill amended, and passed, eod. die. Sent to the Lords, 24 Aug.
Jones, Colonel John, one of the late King's Judges, his Commitment to the Tower by General Monck, approved, 2 June. Excepted out of the Bill of Pardon, for Life and Estate. Journals, to be weekly examined by a Committee, 1 May. -Committee to inspect the Acts and Orders therein, relating to the Government, eod. die. Order for the Report, 3 May. -Entries therein, read, 12 May, and 11 June. Joyce, Cornet, to be secured, 14 May, and 7 June. Ireland, great Seal thereof, and Seals belonging to other Courts there, to be used till further Order, 8 May.-Address of the Commissioners to the Lords, desiring their Concurrence in moving the King to call a Parliament there, sent from the Lords, and read, and a like Address to the Commons read, and approved. Order, made by the Lords thereon, read, and agreed to.-Declaration, for apprehending Irish Rebels, presented, and read. Read a Second time, and another to be drawn. Reported, and Lords desired to concur therein. Conference, desired by the Lords thereon, agreed to, and held. A Proclamation, proposed by the Lords instead of it, reported, and agreed to, with Amendments. Amendments agreed to by the Lords.-Resolutions touching the Rates to be set upon Irish Cattle imported, 20 July. Question for resuming the Debate thereon, Neg. 21. Resolu- tion for adhering to the former Votes. Ireton, Henry, to be attainted by Act of Parliament, 15 May. His Body to be taken up, and hanged at Tyburn, 4 Dec.
-, - Alderman, excepted out of the Bill of Pardon, 13 June. Left out of the Exception, and incapacitated, 13 Aug. Judges of the late King. Vide Charles I.
Ives, St. double Return, Report and Resolution concerning it, 5 May.-touching the Election, 16 July. Justice, Courts of. Vide Courts. -, - Officers of. Vide Declaration. -, - high Court of, for Trial of the late King, Journal of their Proceedings read, 12 May. Committee to inspect it, 8 June. Report. To be sent to the Lords, at their Desire, 20 July. Sent.-Clause, added by the Lords to the Bill of Pardon, for excepting the Persons, who sat in the high Court of Justice upon the Earls of Cambridge and Holland, and Lord Capell, disagreed to, 13 & 24 Aug. Not insisted upon by the Lords. Another Clause, added by the Lords, touching Persons, sitting in high Courts of Justice, amended, and agreed to. Amendments agreed to by the Lords. ILCHESTER, Election, Petition concerning it, dismissed, 5 Feb. Innkeepers, and Victuallers, within the Bills of Mortality, Account of them ordered, 23 Jan.
Interest, Bill for reducing it to 3£. per Cent. for such as served the late King, read, 4 July. Vide Loyalists.-Bill to authorize the taking of 10£. per Cent. from the King, read, 13 Feb. Committed. Considered in the Committee. King's Message concerning it. Intestates Estates, Bill for settling them, read, 16 Apr. Journals of the long Parliament, Committee to inspect them, and report what they think fit to be expunged, 14 May, 1661. -Another Committee to persue the Journal weekly, eod. die. Iron, English, Petition concerning it, read, and referred to a Committee, 19 Feb. Resolution touching a Duty of 40 s. per Ton on foreign Iron, except Spanish, reported, and Debate thereon adjourned, 15 Mar. Question for resuming it, Neg. 18. Judge, gives Evidence within the Bar, 25 Feb. Judges of the late King. Vide Regicides. Ives, St. double Return, Report and Resolution concerning it, 16 May, 1661.-touching the Election, 18 Dec.
-, - high Court of, Act for erecting it to be burnt, 27 May, 1661. JACOB, Dame Elizabeth, Bill to naturalize her, and others, read, 1 June. Committed. Reported, and to be ingrossed, 2 July. Passed. Agreed to by the Lords. Impeachment against the Commissioners for Discovery of Lands gained from the Sea, ordered, 20 June. Impiety, and Profaneness, Bill against them, ordered, 14 Apr. Read. Committed. Reported, and re-committed, 16 July. Journals, Committee to inspect them every Week, 23 Feb.
16° Car. II. Parl. 2. Sess. 3. A. 1663, & 1664. JAMES, St. Bailiwick of, Petition of Inhabitants read, and Bill for dividing it from St. Martin's, and erecting a Church therein, ordered, 6 Apr. Read. Committed, and Petition from St. Martin's referred, 6 May. Iron-makers, their Petition read, and referred to the Committee upon the Clothiers Petition, 30 Mar. JAMES, St. Bailiwick of, Bill for making it parochial, and building a Church therein, read, 29 Nov. Committed, 5 Dec.
Juckes, Thomas, Esq; Bill from the Lords, to sell Lands, 20 Dec. Read, 12 Jan. Committed. Reported, 6 Feb. Passed. Judgments and Executions, Bill to prevent Delays therein, read, 24 Nov. Committed, 14 Dec. Reported, and to be ingrossed, 1 Feb. Passed. Agreed to by the Lords, with Amendments, and one of them disagreed to, and Conference to be desired with the Lords thereon, 1 Mar. Amendment not insisted upon by the Lords.-Bill to prevent arresting and superseding them, read, 7 Feb. Committed. Reported, and re-committed. Reported, and to be ingrossed. Passed. Agreed to by the Lords, with Amendments, and Amendments agreed to, 1 Mar. Juries, Bill to prevent Miscarriages in them, presented, and withdrawn, and to be fair written, 7 Feb. Read. Committed. Reported, and re-committed. Reported. To be ingrossed. Passed. Agreed to by the Lords, with Amendments, and Amendments agreed to, 2 Mar. IVES, St. Election, Hearing adjourned till the next Session, 31 Oct.
Impeachment, against the Canary Company, Question for it not put, 29 Oct.-against Lord Mordant, resolved, 18 Dec. Vide Mordant. Journals, to be inspected only by Members, 22 Oct. To be examined weekly by a Committee, 4 Feb.